A short while back we were in the water again. This time our search was focused on whale sharks and sea lions. 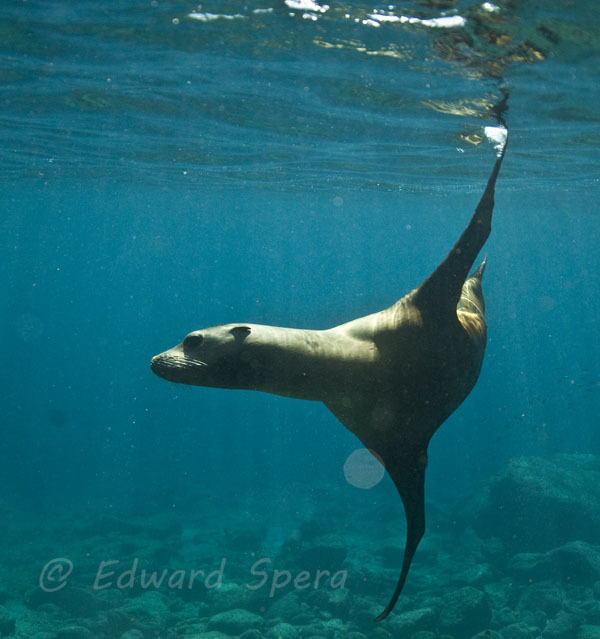 The Sea of Cortez is active all year with different whales migrating through its waters. Whale sharks spend most of their day searching for and feeding on plankton. 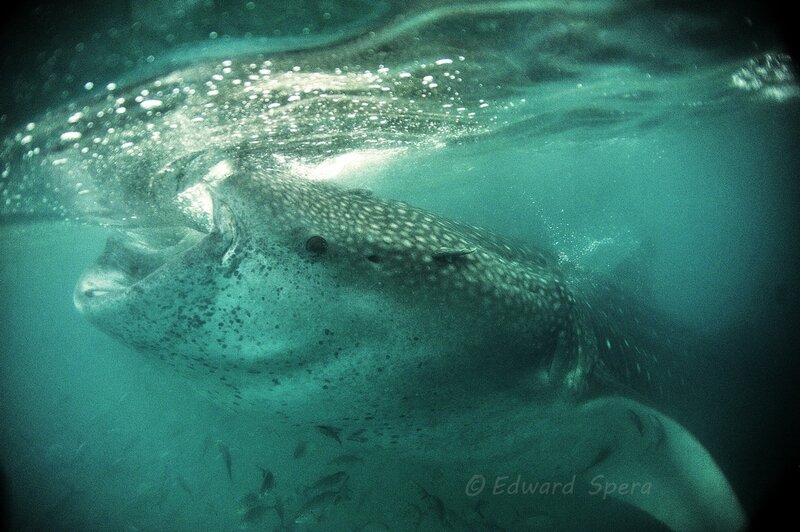 When we found a feeding area we slipped into the water with snorkels and cameras and let the action happen. 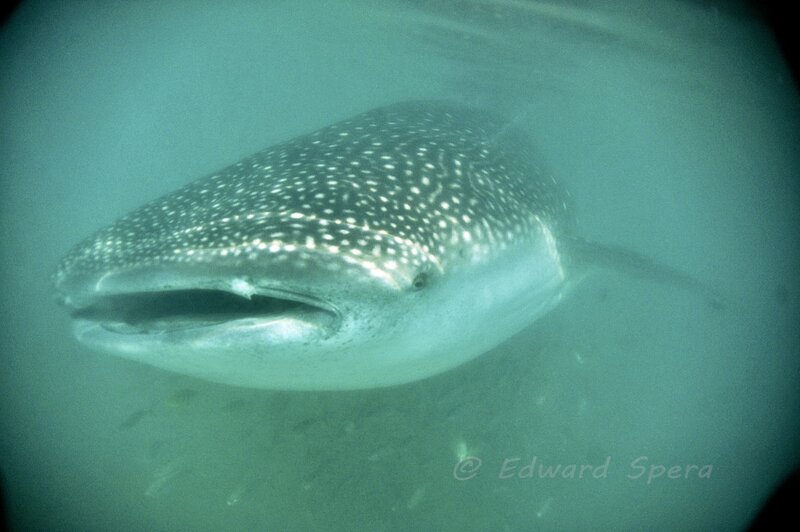 These gentle giants are not aggressive and truly had no problem with our presence in the water. Over a couple days we had 15 to 30 footers swimming around us. Visability wasn't the best, but it made for some eerie experiences as these great fish swam into focus. 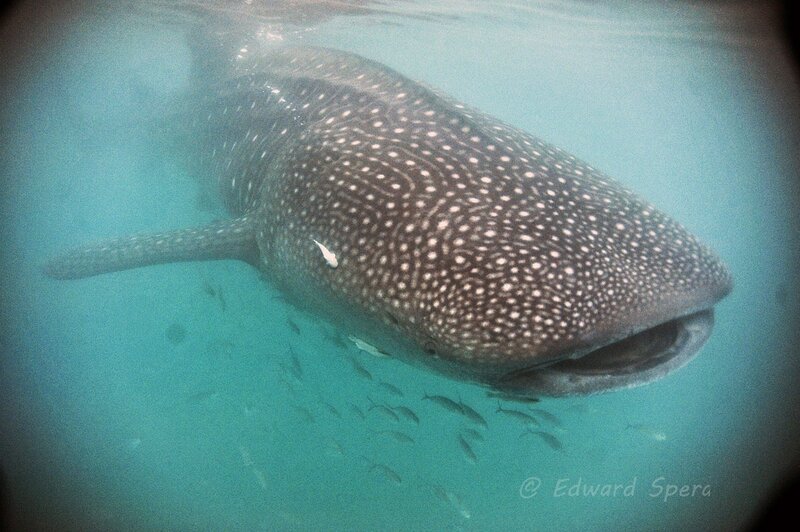 At times we had 3 or more whale sharks feeding around us. Like a huge vacuum they took in gulps of plankton rich water and filtered it through their gills. They were so oblivious to our presence we felt like we were going to get sucked in with the plankton. 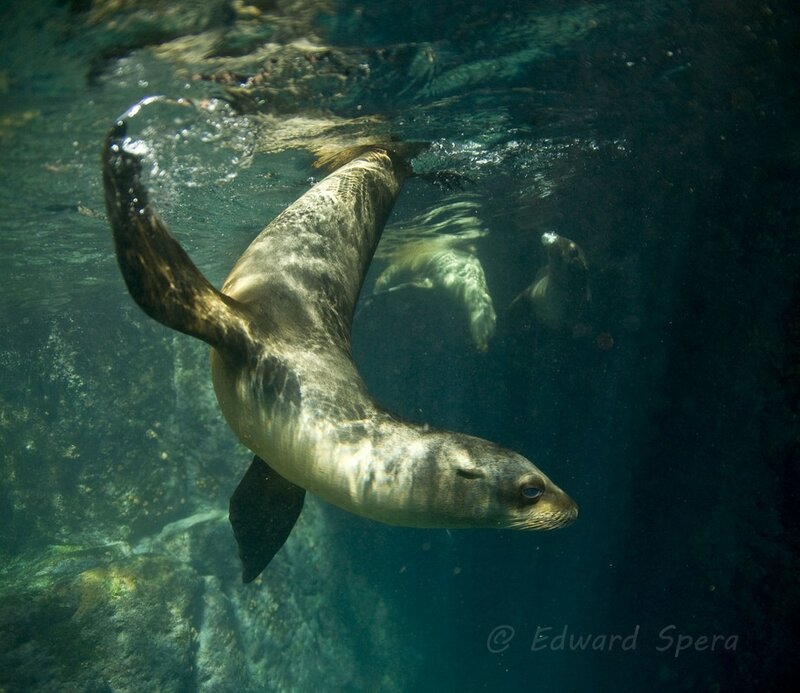 A secondary part of our trip involved getting in the water with a colony of Sea Lions. This ended up being a great highlight of our trip. 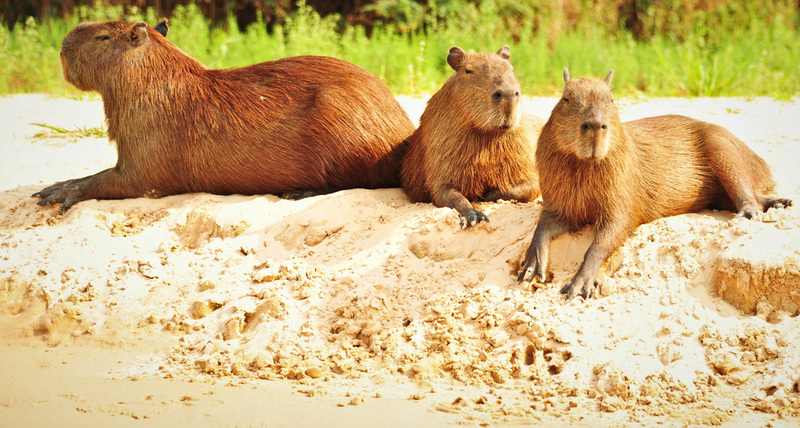 The interaction we had with these curious and playful mammals was off the charts. They nipped at our fins and snorkels in an underwater game of tag. At one point I had a young one climb on my back for a little ride. I couldn't get my camera clicking or aimed fast enough. 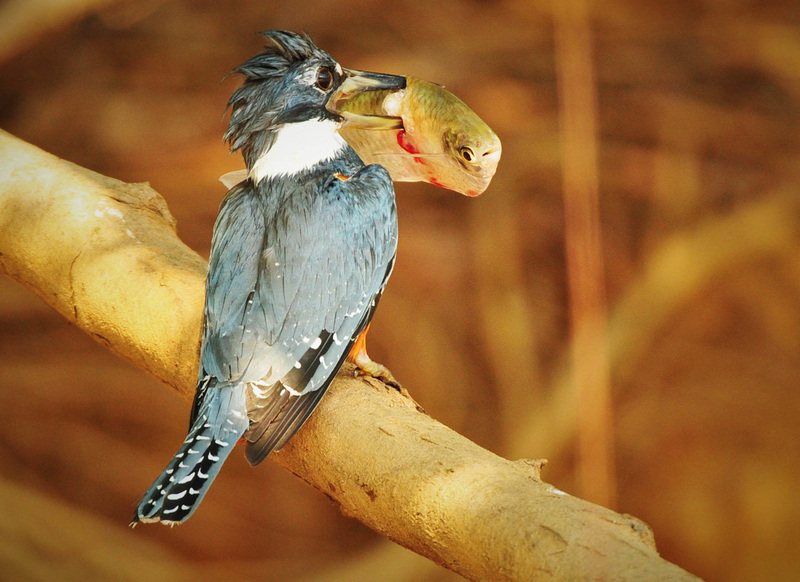 Wildlife moments like this takes our understanding and appreciation of the natural world around us to another level. Being in another creatures environment and literally playing by their rules makes you realize the incredible intelligence and personalities of these amazing animals. I had great respect for sea lions before this adventure, but everything has gone to a whole other level. Up next... Orcas of Norway!!! 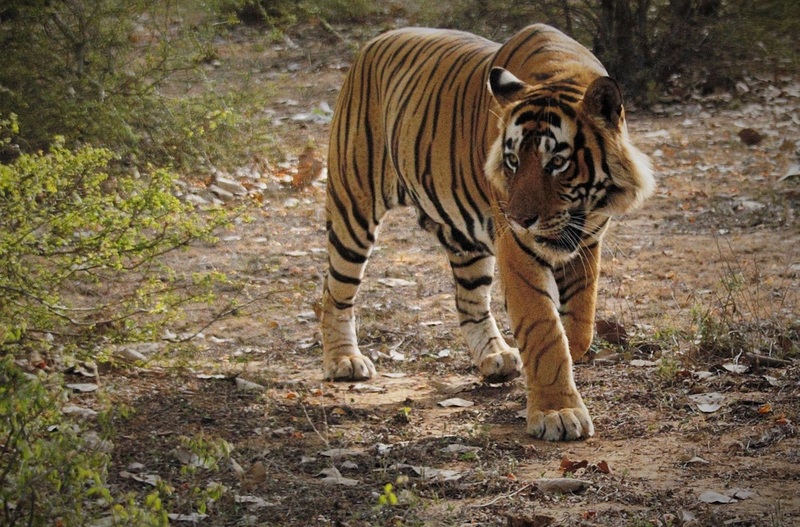 Backtracking a few months, we were focused once again on Tigers of India. 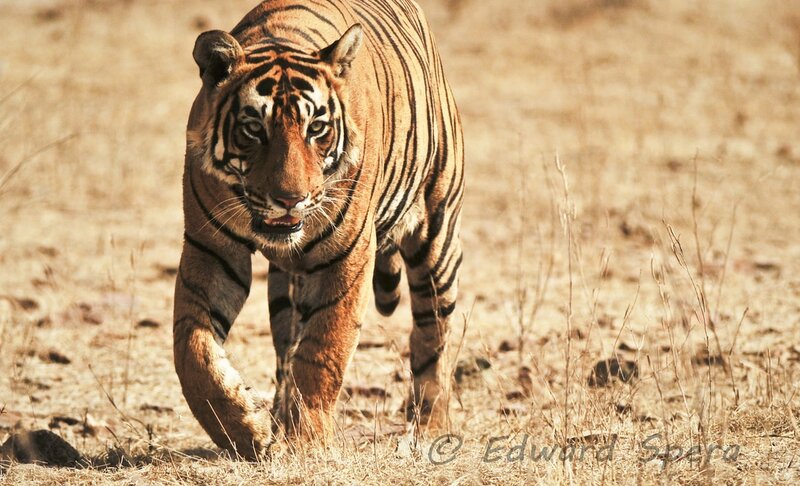 Easily one of my favourite animals on the planet, the sight of one of these amazing cats in its natural habitat still makes my adrenaline flow like nothing else. Reports were surfacing and sightings had been very good leading up to our arrival. We were psyched to get the jeep moving as soon as we could. 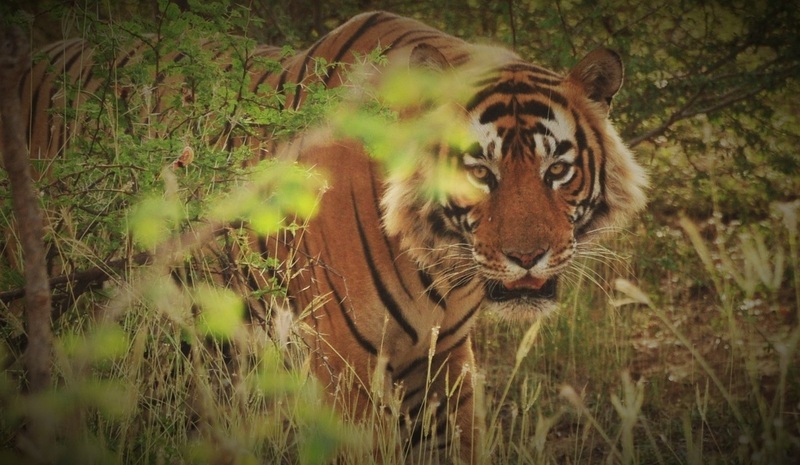 We entered the park shortly after day break... within the first hour we had our first tiger. It was a young female and judging by the smell she had a kill nearby. This female and her brother have recently left their mother. 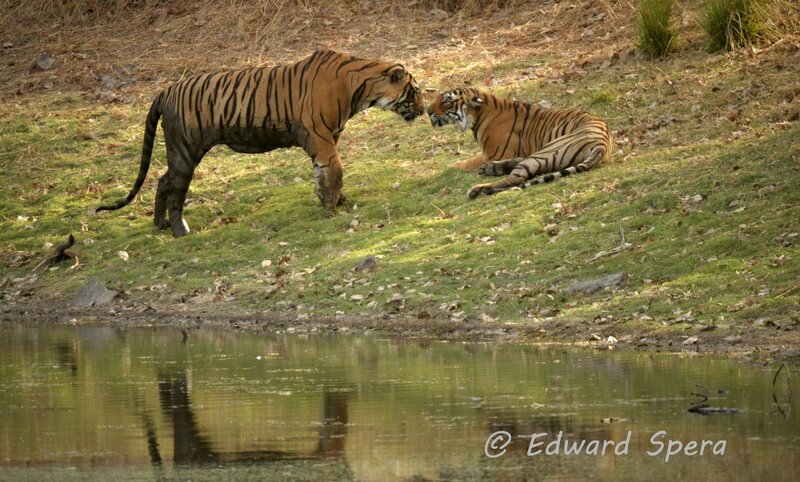 They still remain in her territory, but now they hunt for themselves... well the young female does. 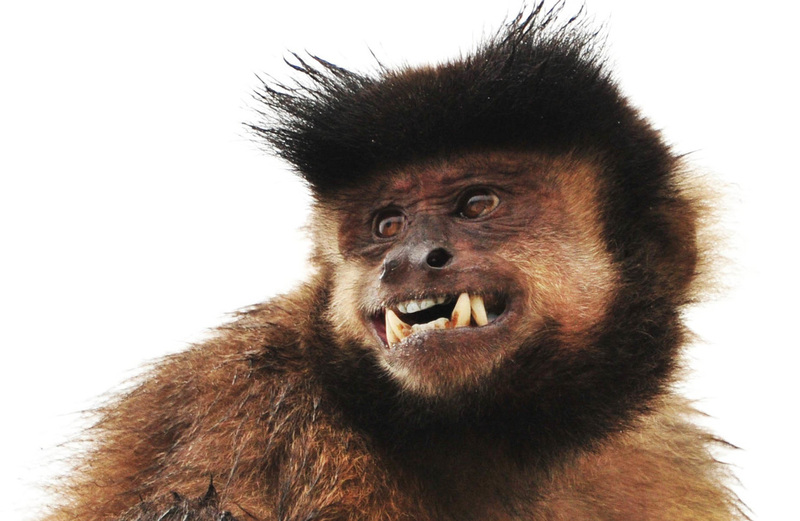 Her brother has a fraction of her hunting skills and relies heavily on his sister's kindness and shares in her kills. Also, he is bigger and stronger than her and apparently takes what he wants. The next day we had great encounter with the brother. We first spotted him out in the open and on the move. He seemed to be searching for something, constantly raising his head and smelling the air. Was it his sister? His mother? Or a fresh kill made by a new tiger? 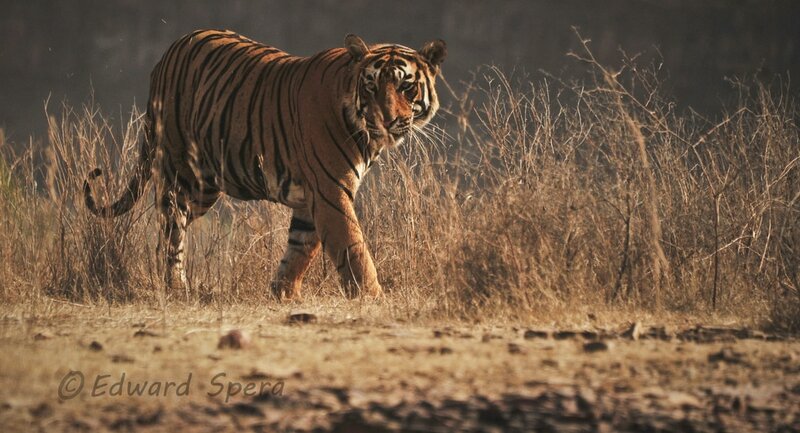 We followed him for 2 hours as he marched along, only stopping to cool off in a few watering holes. In the end it was his lovely sister, but unfortunately for him she had no food. A short time passed and his sister started to move. She slipped into a dense patch of grasses and her brother was close behind. A small lake on the other side of the grasses was a common drinking spot for a range of wildlife. We repositioned our jeep near the lake and waited. A small herd of spotted deer cautiously made their way to the waters edge. 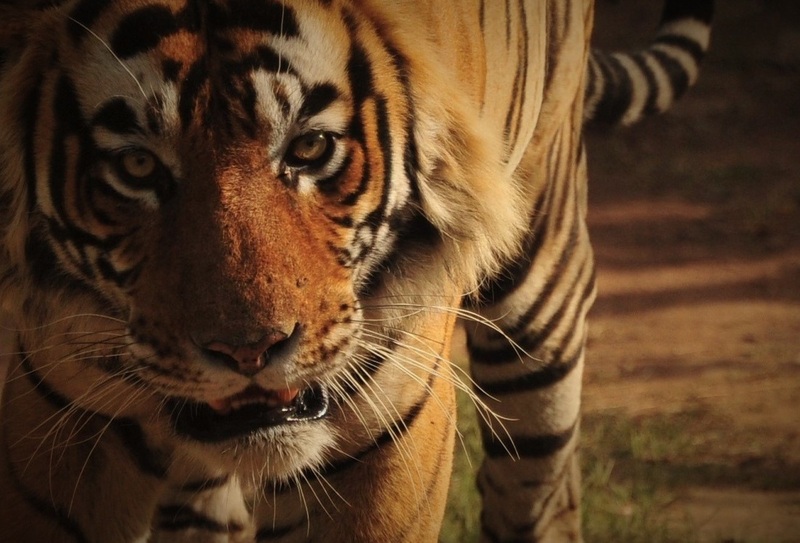 At this point we did not know exactly where the young tigers were. 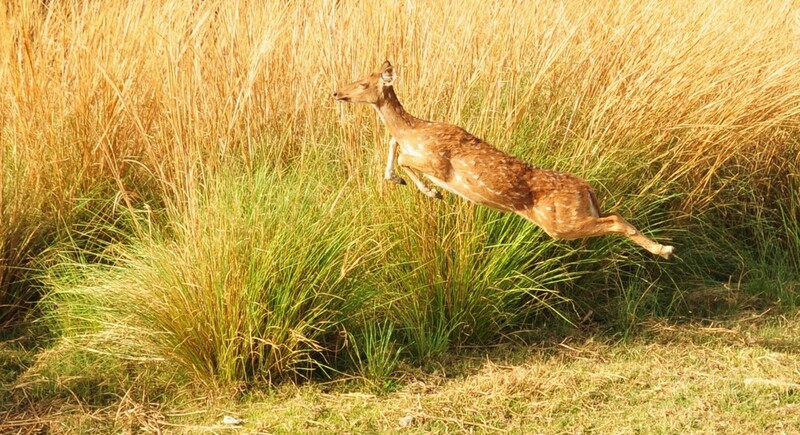 Then in a startling burst the deer bolted. Big brother made an appearance, but spooked the prey and they fled. Unfortunately, he was too far away to have a chance at a take down. So he walked over to some shade and had a little roll around. Time to wait and see what sis can do. 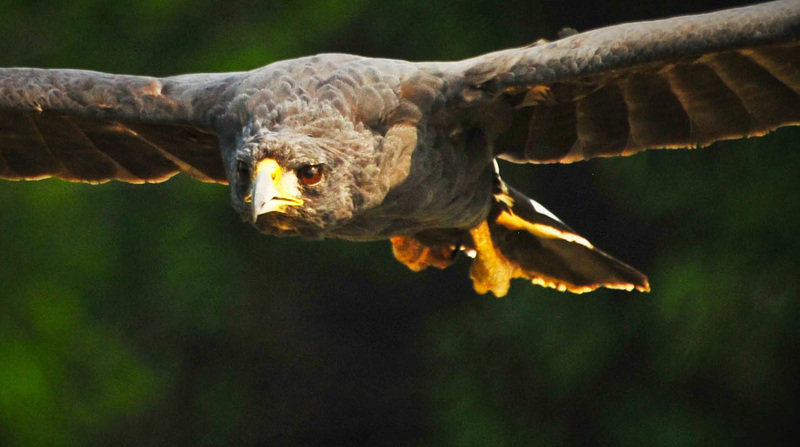 Over the next few days we had a few brief sightings and heard numerous alarm calls. Our luck changed with another great sighting. Now it was mothers turn to show off her beauty. Over 3 hours we patiently watched her positioned by a muddy watering hole. As the sun set the light became incredible. Another great adventure filled with great new inspiration for my work. 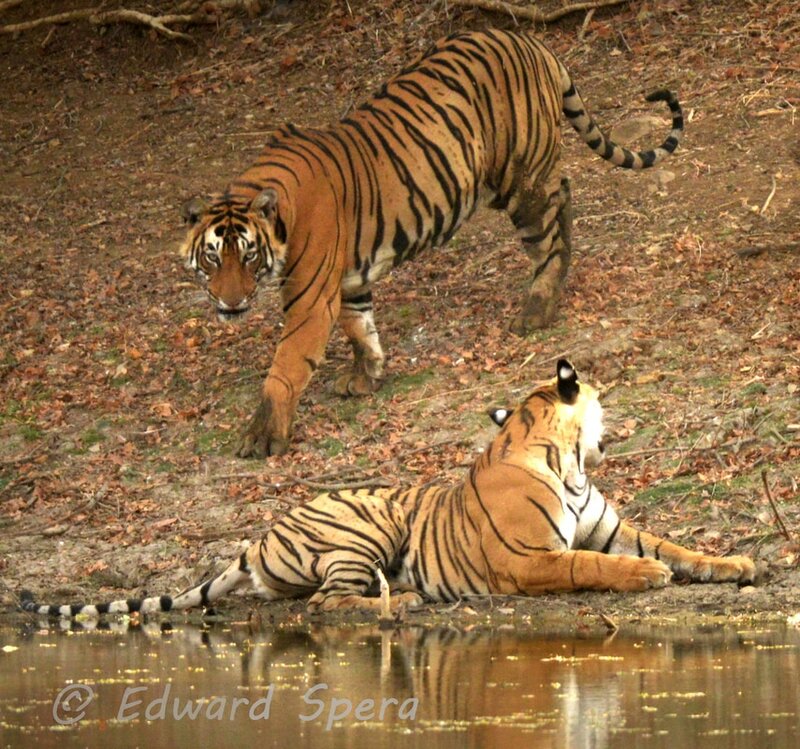 No matter how often we go to see tigers in the wild, I am always left completely amazed at their beauty. Until next time. 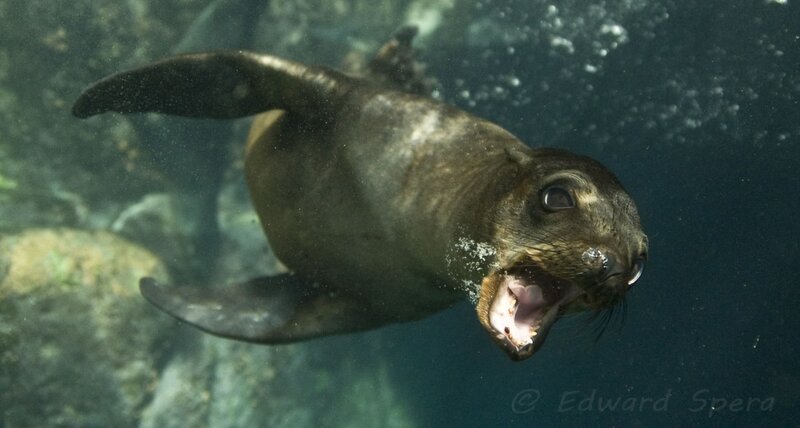 Up next...Whale sharks and Sea Lions of Mexico. Our next few days on the water were very rough. " The seas were angry that day my friend " ...for the Seinfeld fans. 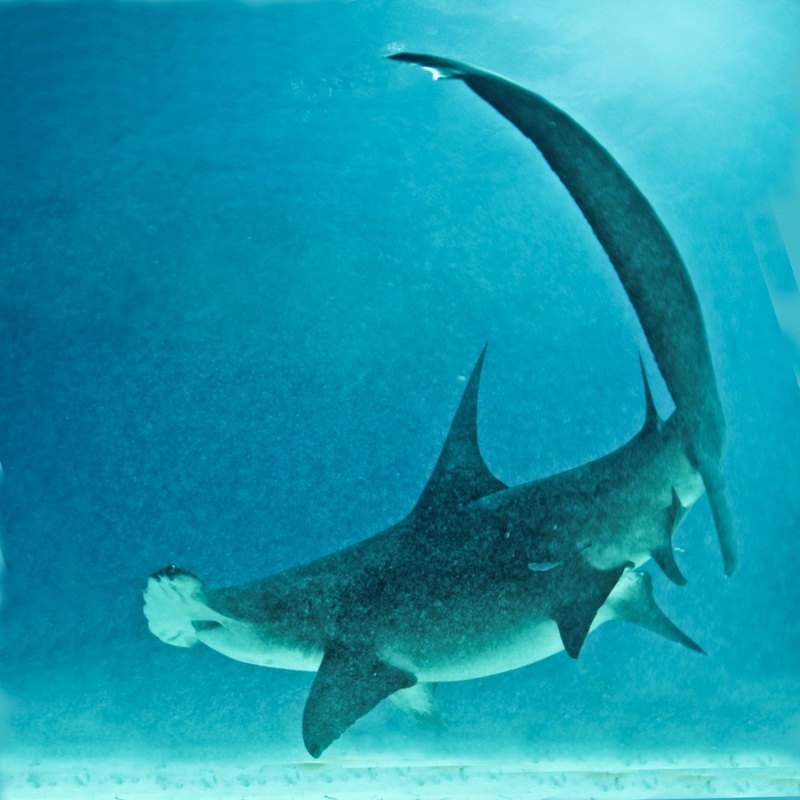 We found out that during full moon periods sharks become scarce, heading to deeper water at this time. With some choppy water conditions and lunar cycles working against us we kept our fingers crossed. Such is wildlife though... one day wow and the next day ho hum, but our search continued and the patience paid off. 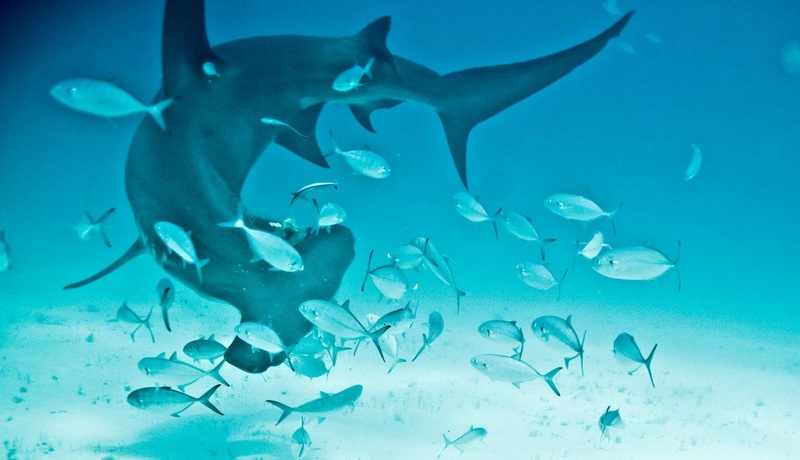 Back in the water we went and were joined by 2 Hammerheads, 2 Bull sharks and a number of nurse sharks. 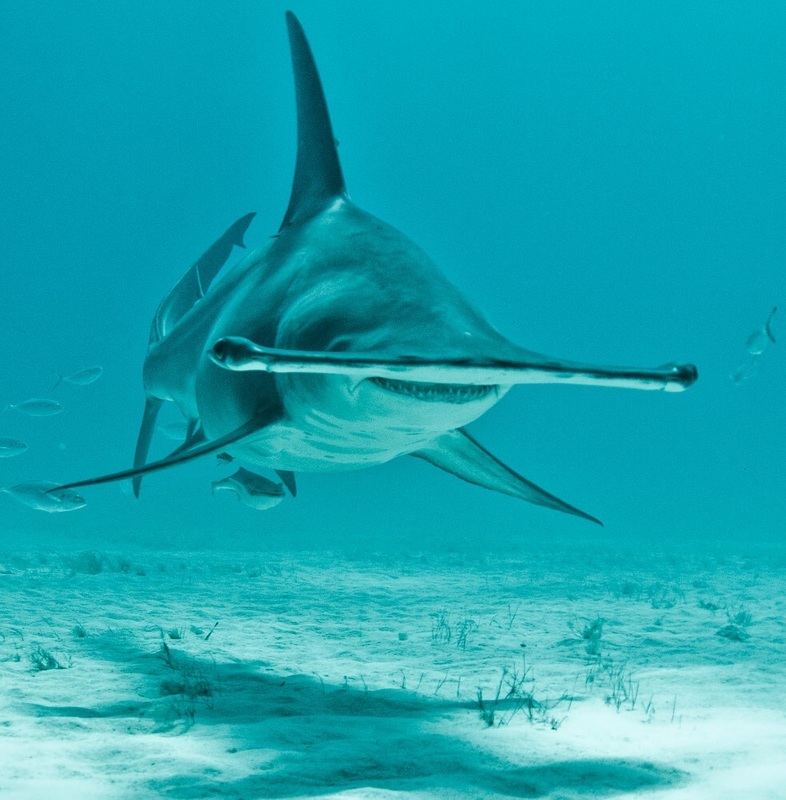 Hammerhead Sharks have evolved over millions of years and their appearance is very unique in the marine world. The shape of their head enables them to better skim along the sandy ocean floor in search of their main prey... sting rays. They sweep their heads back and forth like a metal detector and pick up on the electrical impulses given off by the rays. 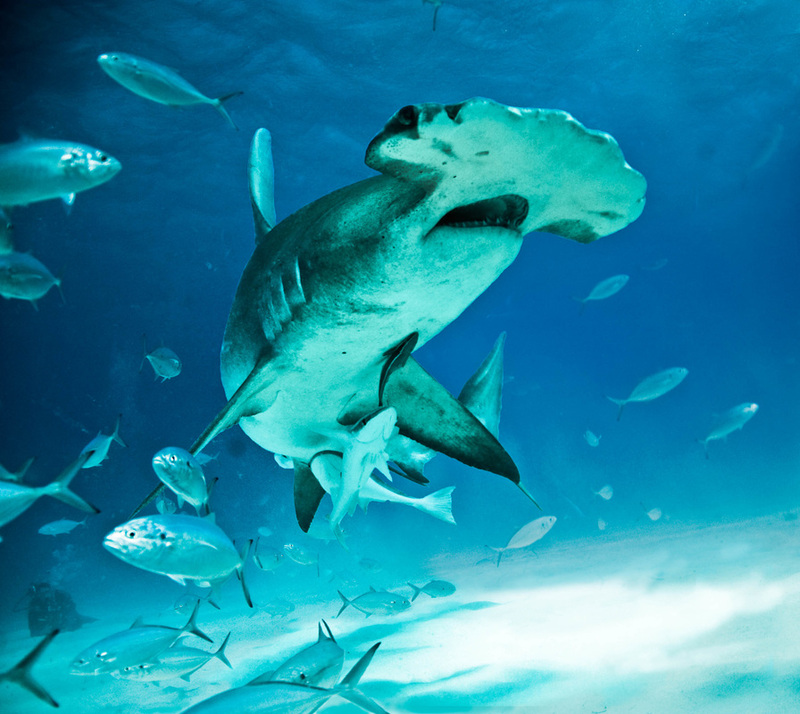 All sharks have this electro-receptive ability. Unfortunately, this amazing advantage leads to huge distractions by underwater electrical lines drastically affecting their feeding patterns. Once again, human development negatively impacting the living world around us. Our time with the sharks passed by far to quickly. 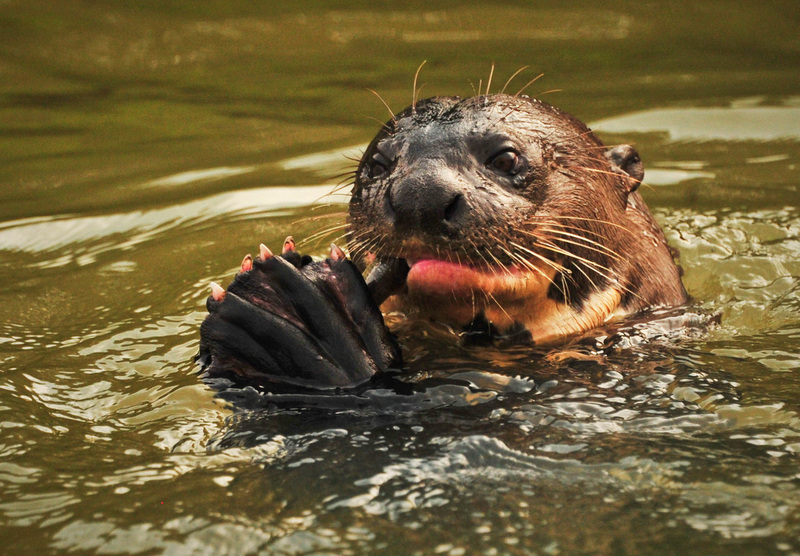 These encounters have elevated our ever increasing passion for the marine world. Our minds are left spinning with future journeys into the waters of our world. Sadly, we feel pressured to quickly do as much as possible, as the oceans, specifically sharks, continue to lose ground at an alarming rate. Try to picture the last documentary ever on shark week ending in a restaurant staring into bowl of soup... tragic and very real. Back into the water we go. Over the last couple years I have been creatively moving into the marine world. Following last years experience with Humpback whales we decided to do something with a little more bite (yes, pun intended). 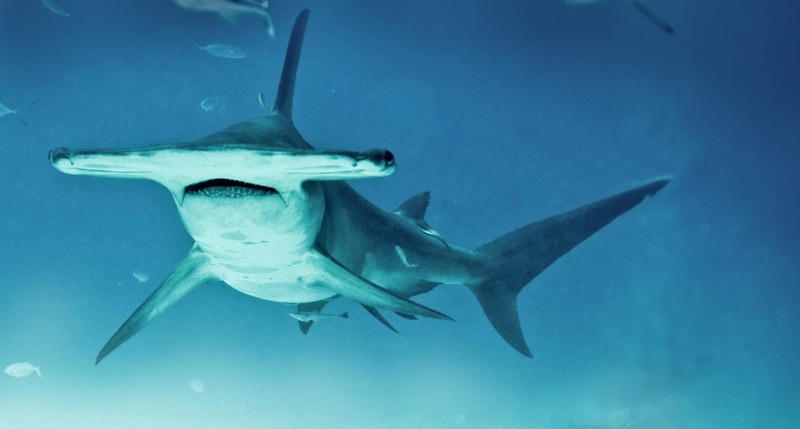 How about some quality time with Hammerhead sharks. 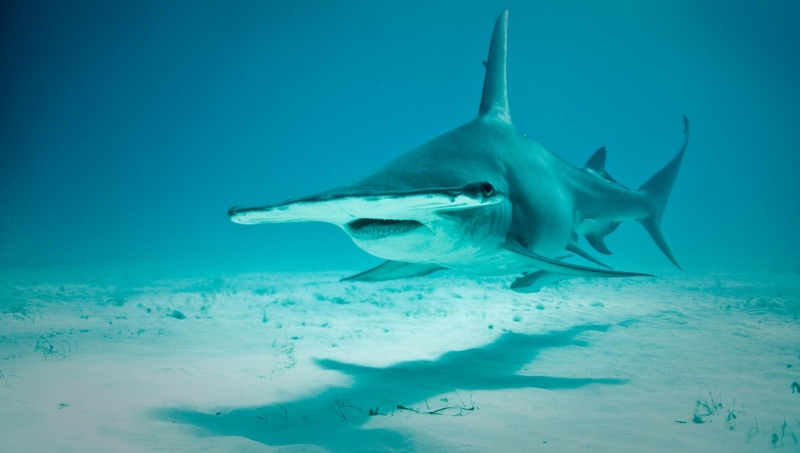 One of the best places on the planet to see these unique predators is Bimini, Bahamas. This small island lies mid way between the main Bahama Island group and Florida, USA, right on the edge of the gulf stream. 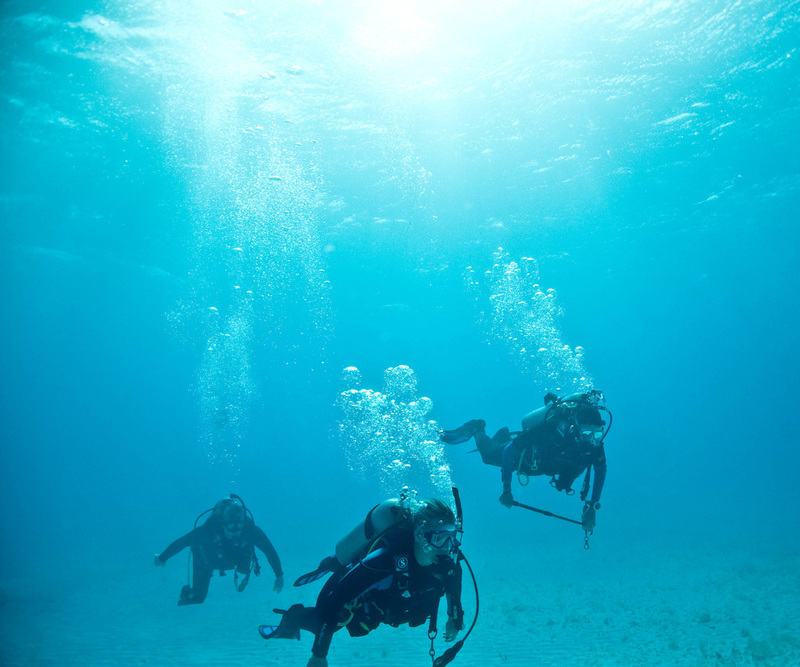 As a result marine life such as Whales, Whale sharks and various other types of sharks migrate through this area. 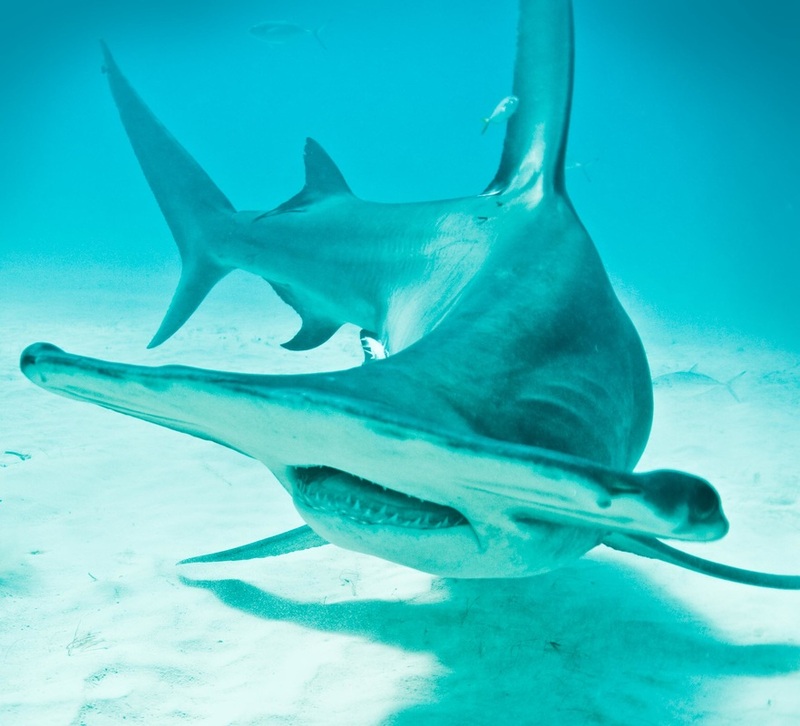 The sharks we're searching for here are the Great Hammerheads reaching sizes of 20 ft and over 1000 lbs. 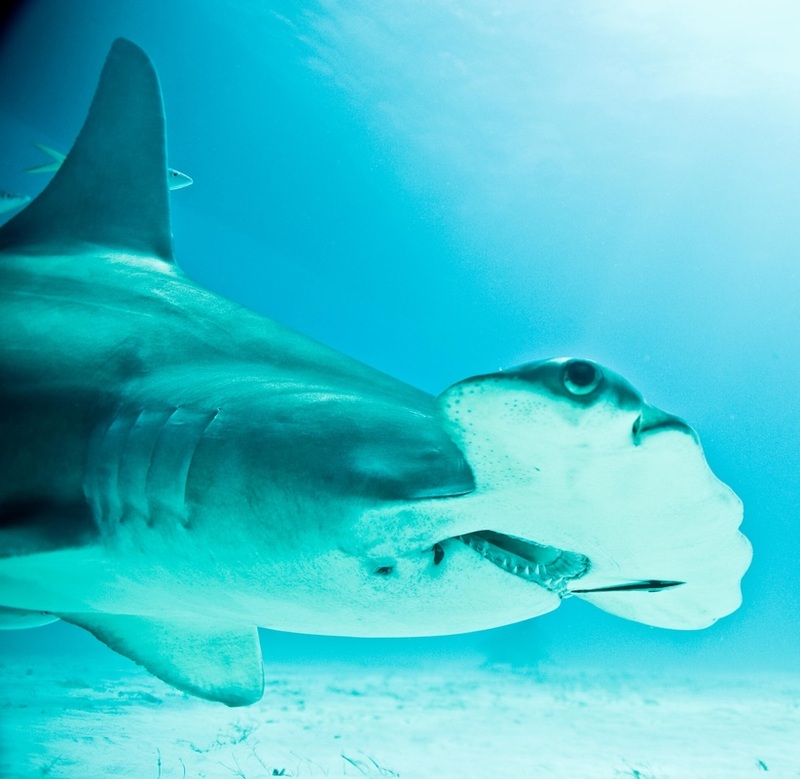 These beautiful creatures, like all sharks, are endangered due to humans. 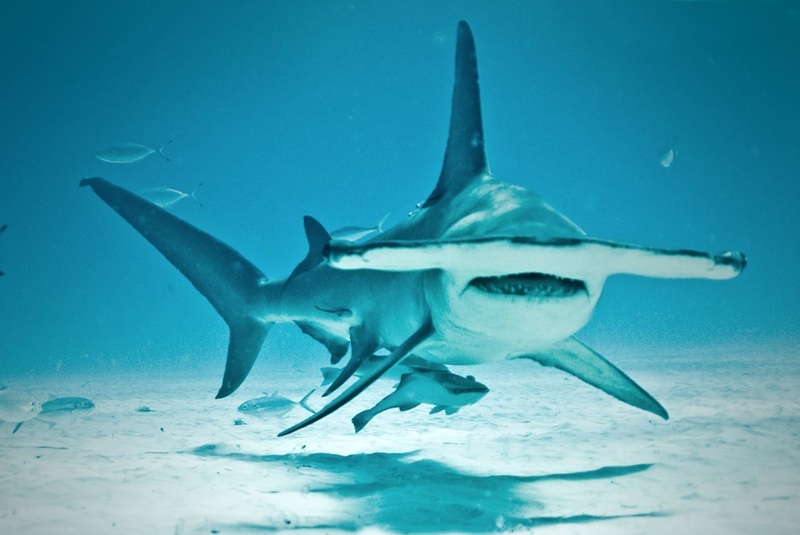 Attacks by Hammerheads on humans are rare, but have occurred and no, we were not in a cage. An added bonus was the fact that Bull sharks, which can reach a length of 10 ft.+, would likely be joining us on this dive. 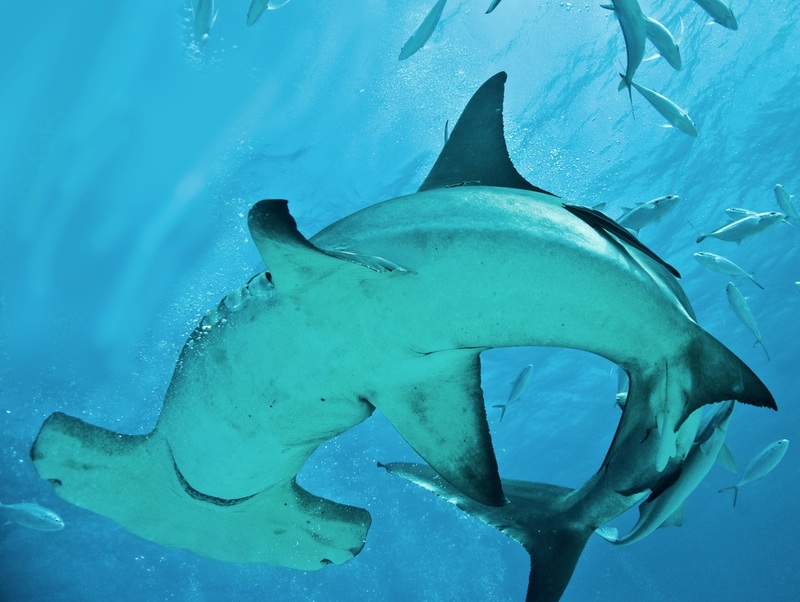 These sharks can be very aggressive and have been linked to attacks on humans worldwide. 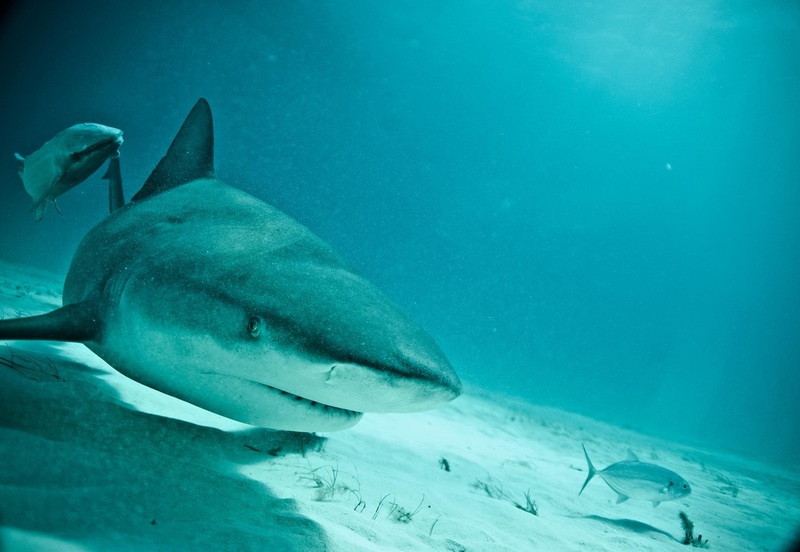 Shark attacks of any type are incredibly rare, especially in clear water, and 99.9% of shark related incidents are accidents, because the shark thought you were something else. Knowing how to behave and respecting what is around you at all times is half the battle. Our dive started with the immediate presence of Bull sharks. 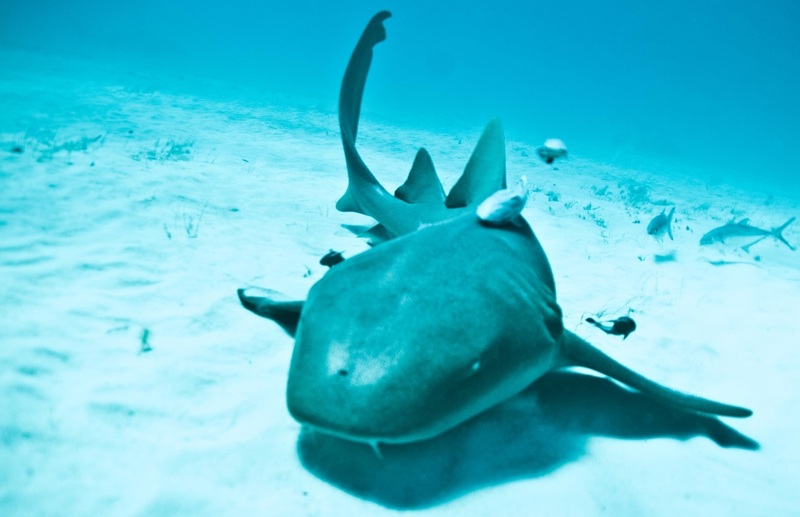 And a number of Nurse sharks, very passive little puppy dogs of the ocean and up to 15 ft in length, were also present. If a shark can be cute, this is it. It didn't take long and off in the distance a silhouette appeared. It was "Hammer Time!" (Ahh come on, it had to be said). 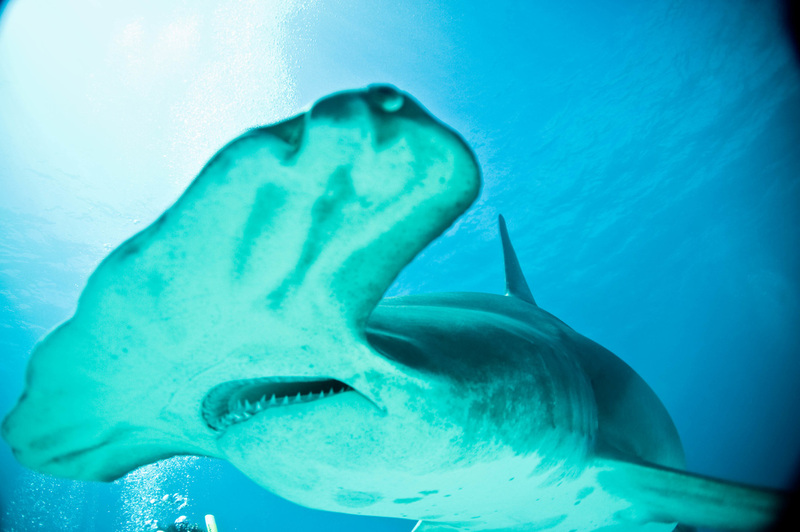 Today we had an encounter with one of the most remarkable creatures on the planet, the Great Hammerhead Shark. This incredible first day made the trip worth while ten times over. The exciting part is we have just begun. With a couple more days in the water we can only hope to add to this adventure... stay tuned. 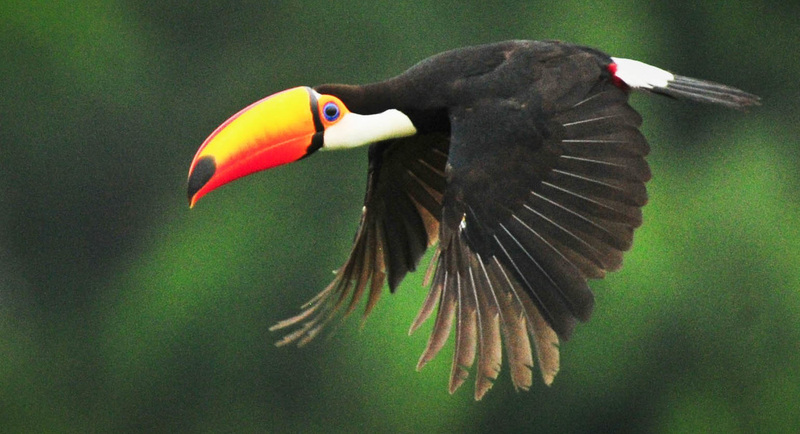 Our time in the Pantanal is coming to an end, but a few surprises still awaited us. 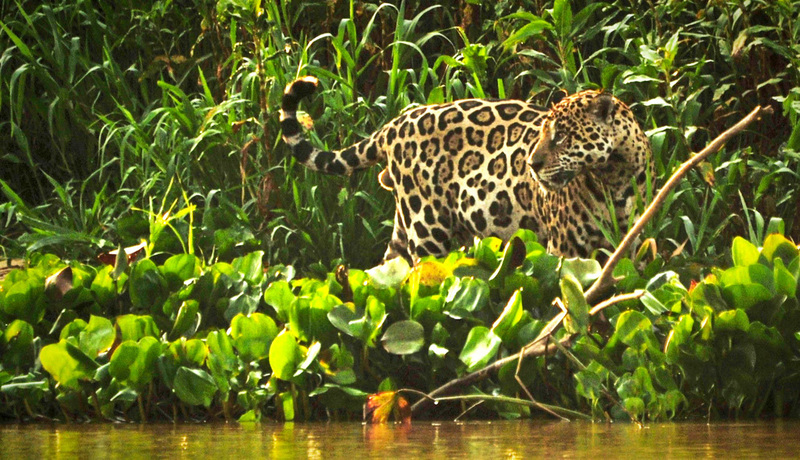 Late yesterday as we approached our base we spotted two Jaguars on the riverbank up stream. This couple was together for a mating session. 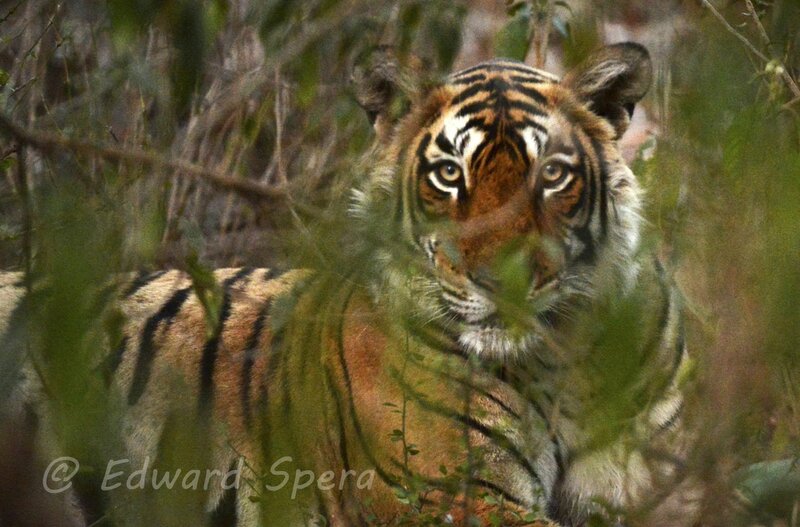 The male was known to the guides, but the female was new to the area and we were the first ones to get a photo of her. 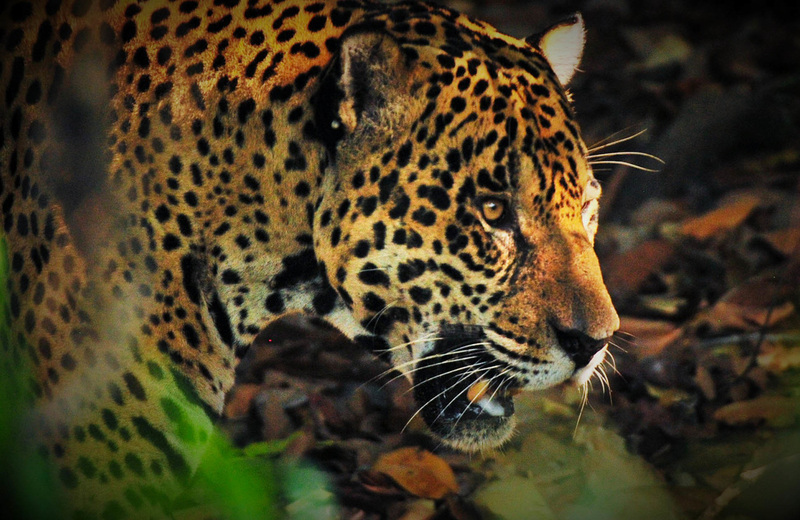 Jaguars, leopards and tigers have unique patterns to their markings that stay the same throughout their lives. Since we were the first to get an image of this female we were given the honour of naming her. We called her TESA ( a combination of intials, first or last, of the four of us in the boat ). Tesa's the beauty in front. Into the next day, Tesa and her boyfriend were nowhere to be found, but a second couple made an appearance. The male we had seen a few times now, but the female was new to us. They had just started a 5-6 day mating courtship. 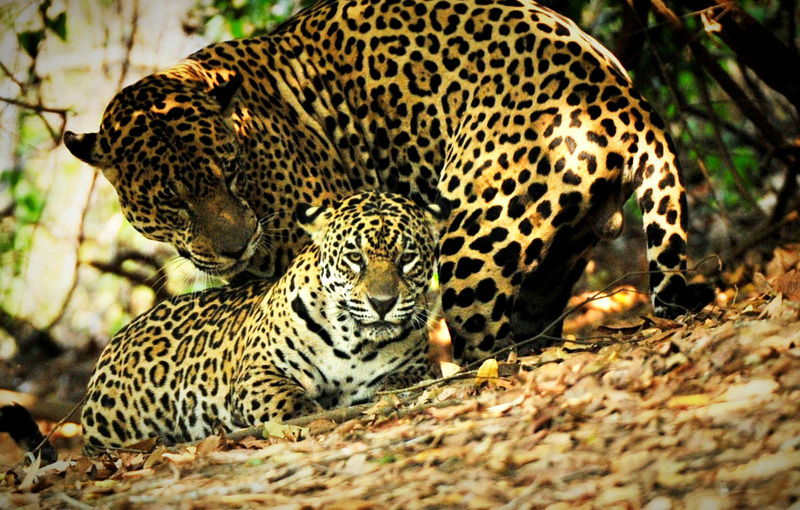 If successful in 3 months a new set of Jaguar cubs will enter the world. After a few hours they moved away from the river's edge for a little more privacy and some quite time to enjoy the sunset. 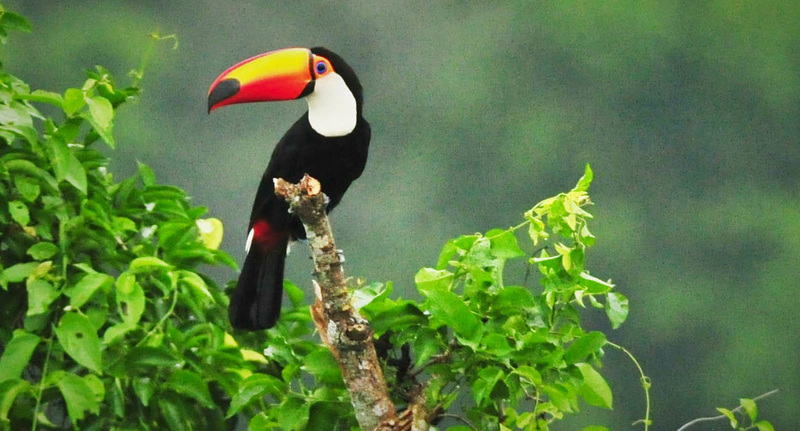 From hear we moved further south to observe one of earth's natural wonders, Iguazu Falls, but the couple days leaving this remote region was full of great surprises. Reflecting on the incredible sightings and inspiration this trip has revealed, we spent our last days hiking around Iguazu Falls. Both the Brazilian and Argentinian sides were breath taking. This trip was fantastic on so many levels. 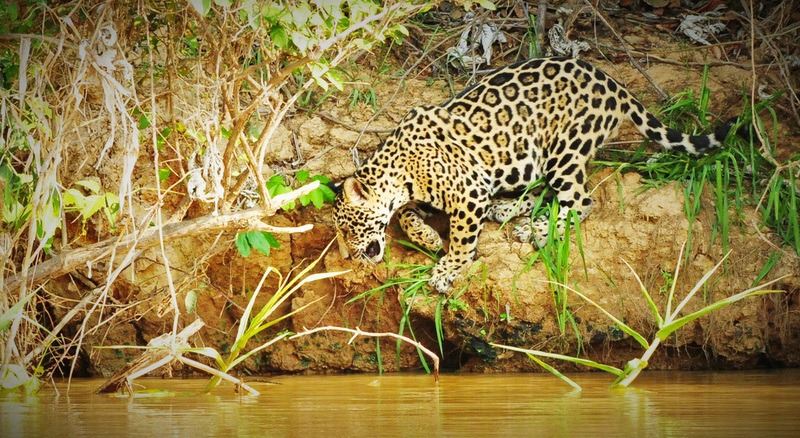 Our jaguar total ended at 11 different cats and some with repeated sightings. 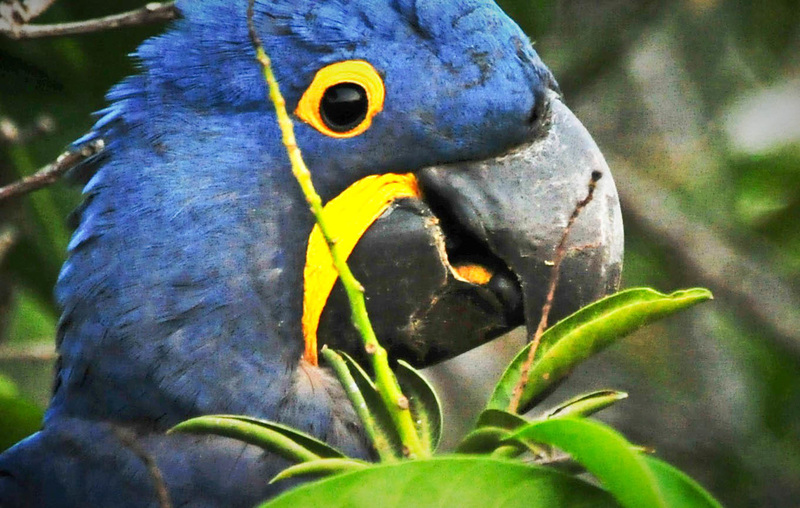 The bonus sightings of Hyacinth Macaws, Giant River Otters, the bird life and more, brought this adventure into the ranking of one of the best wildlife journeys to date. 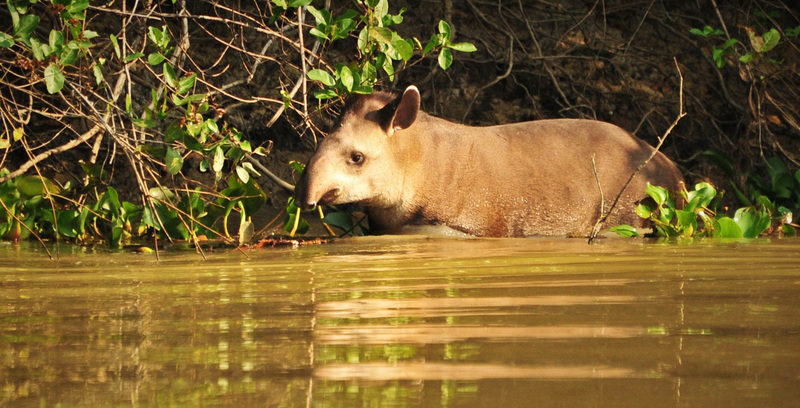 We will return to the Pantanal again, if for the only reason to find our lovely Tesa. Hope you enjoyed this Brazilian experience. Next stop Cambodia and Northern Thailand starting late December. Safe travels and good health to all. Obviously, our focus is the big cats on this journey, but we took advantage of seeing other unique wildlife in the area as well. 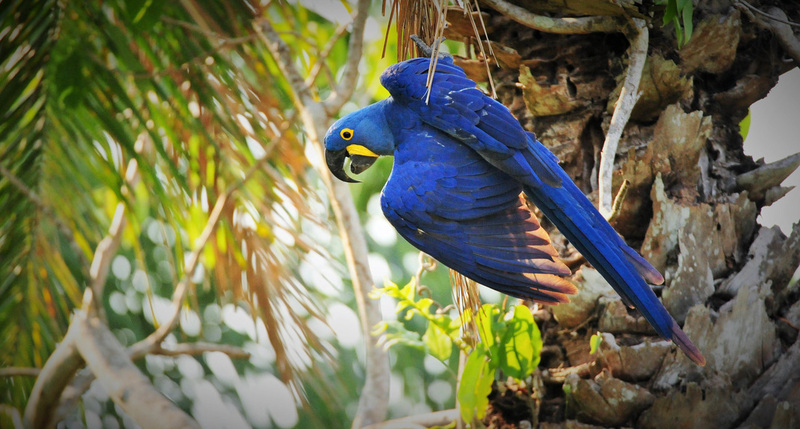 Early morning we headed up river to a known Hyacinth Macaw nesting area. 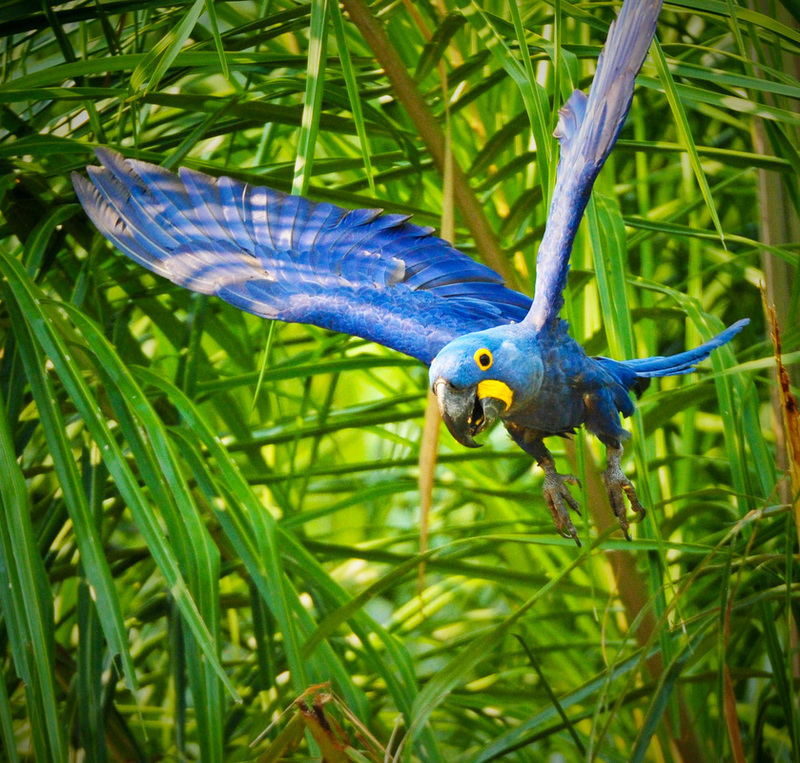 These are the largest of the macaw family and are critically endangered in most of their historic range. 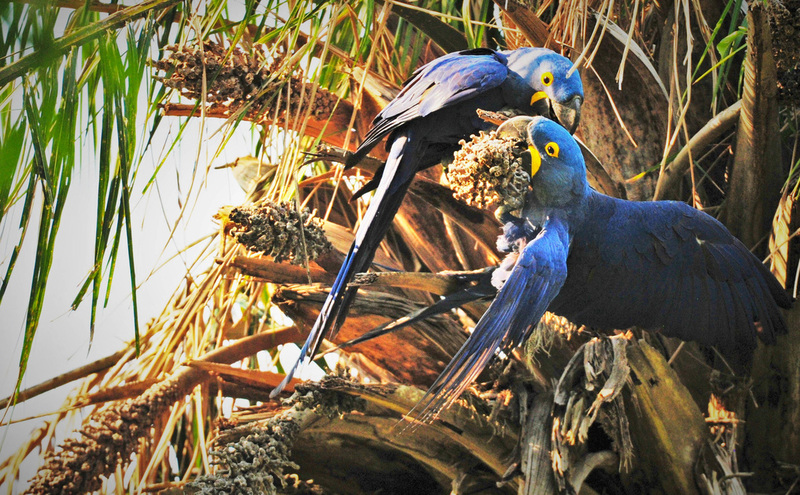 Our guide knew of a location with numerous nesting pairs in the area. As we navigated the river we are always scanning the shorelines for anything exciting. 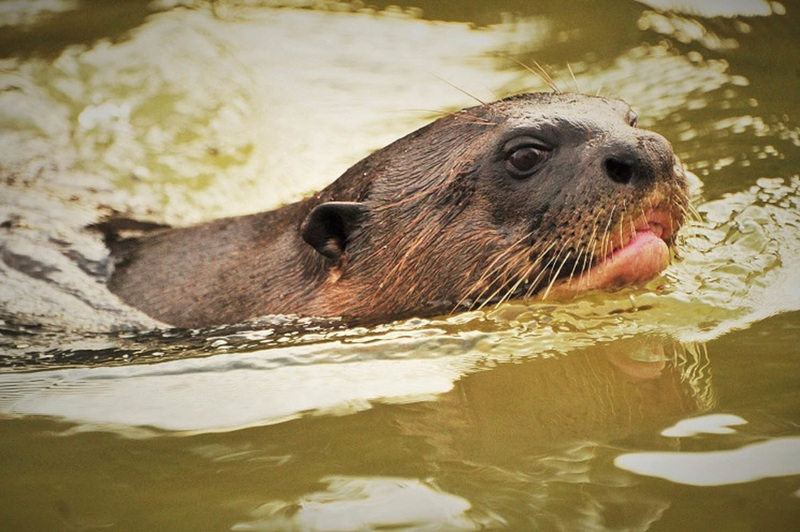 Without fail a family of Giant River Otters, five in total, makes an appearance hunting along the river's edge. It was amazing to watch as they worked together, maximizing their agility and great speed, to encircle and trap fish in the shallows. We needed to move on as it was still a good distance to reach the Hyacinth location and we were losing dramatic early morning light. These birds need very specific types of trees to nest and feed in. 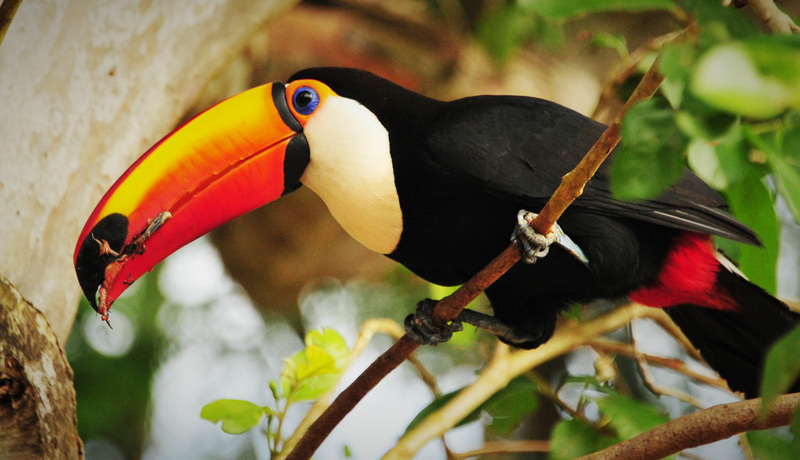 Logging has devastated most of these areas and illegal trade of these wild birds is doing the rest to bring these amazing creatures to the brink. We soon reached a beach area and, with cameras in hand, we jump out and made our way into the forest. The first Hyacinths quickly make an appearance as we moved into the trees. We can hear more in the distance as they are very loud in their communications with each other. 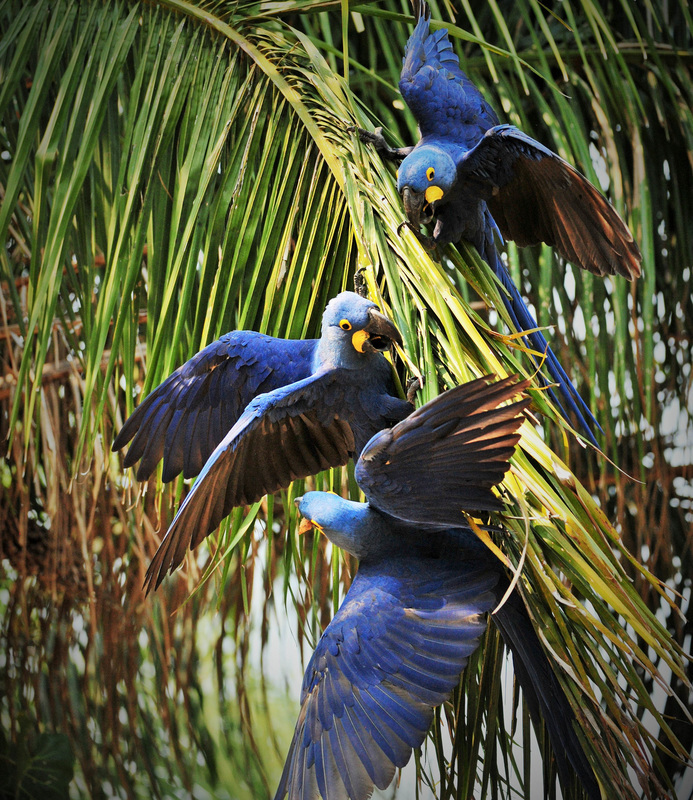 The next few hours were unbelievable watching the Macaws socializing, courting, feeding and flying from perch to perch. In some cases they showed their playful nature by hanging upside down as if showing off. Time flies when your having fun. 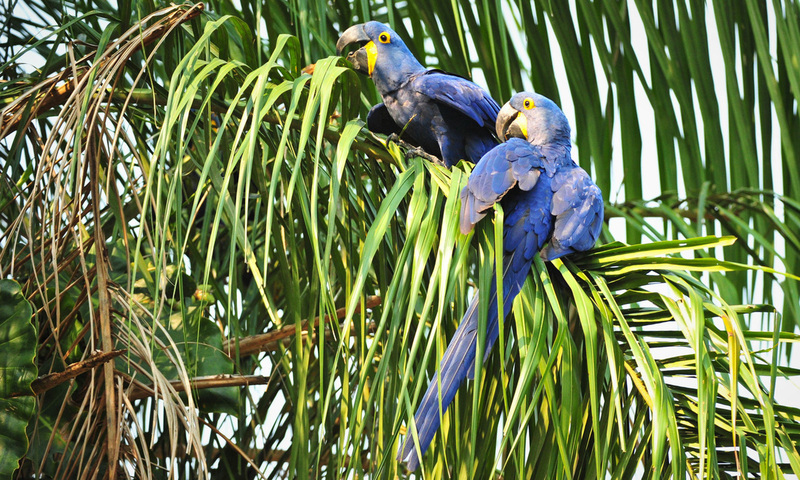 This has been the best chance for me to see Hyacinth Macaws in the wild. I couldn't have asked for a better experience. Back down the river we went in search of our daily Jaguar fix. A report came in about a big male sighting not to far away. The local boat men network is quite impressive in communicating info with one another and this was a huge advantage to us in maximizing our chances seeing Jaguars. 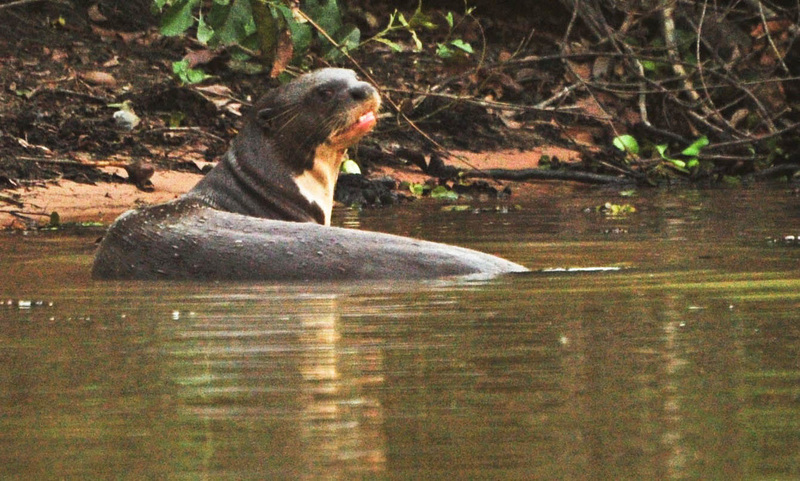 Before we made it to the male sighting a beautiful female made a brief appearance along the river's edge. She seemed content to just sleep in the shade for a while. We heard the big male was on the move. I hate to leave a Jaguar in pursuit of another, because these cats can vanish in an instant and you can lose a great photo opportunity on both if you are not careful. Fortunately for us we found the big male and these following images speak for themselves. Mind blowing! 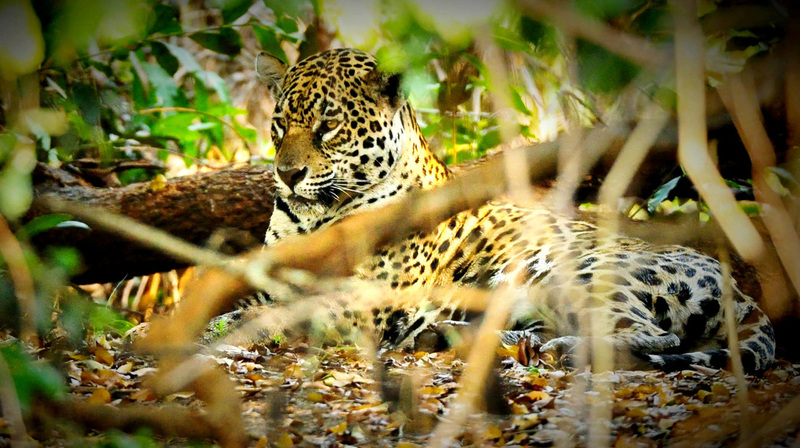 I've had the privilege of seeing Jaguars in Belize and Guyana, but not like this. We have had daily sightings of these cats and our heads are spinning. And I'm not talking about the same Jag seen over and over again, incredibly most are different cats. I can't even imagine what the next few days will bring, but I'll be ready with camera in hand to say the least. 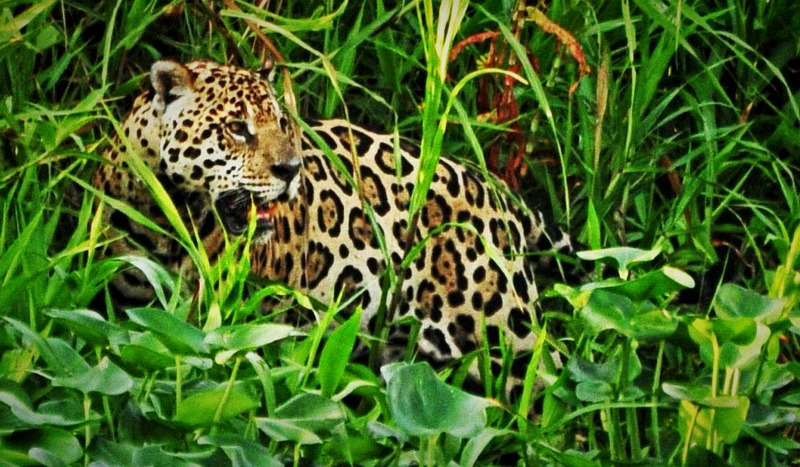 ﻿ Now that the pressure is off after seeing 3 Jaguars, we go into the next few days a little more relaxed and very excited. Heading out early morning we search the river banks where the cats were seen last night. It didn't take long for us to see our first Jag of the day. 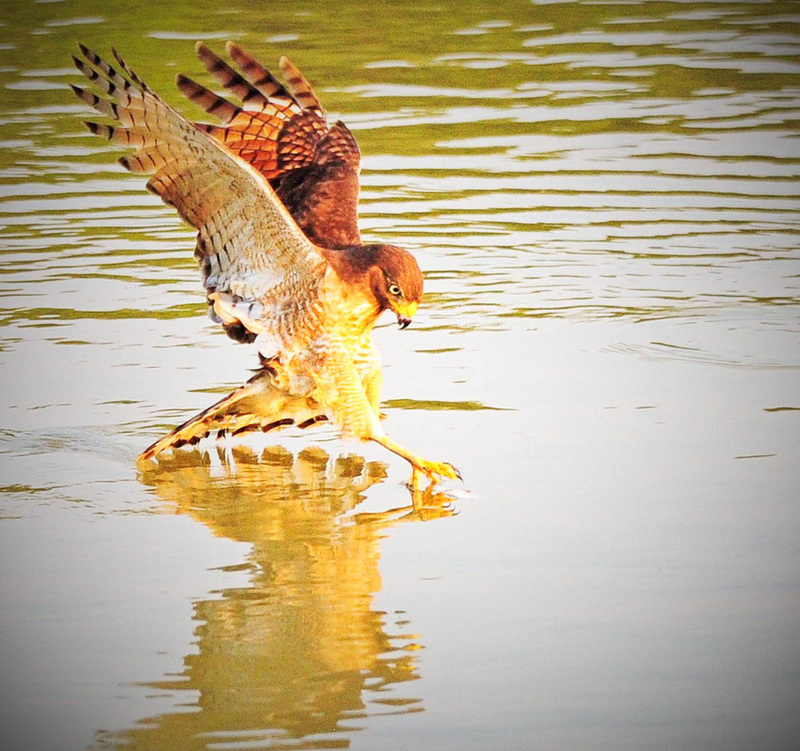 The first male from yesterday was hunting along the river up stream from our location. For over an hour we slowly followed him along the shadows of the river edge. The next day we moved a good distance up river. There were reports of a mother Jag & 2 cubs spending time along the river. Our boat man turned up the throttle and off we went. Along the way we paused for amazing photo ops of caiman basking in the heat of the day. You don't pass by one amazing thing just to get to another... if its meant to be, its meant to be. After a few hours we reached the general location of the Jag family. By late afternoon we came upon the family we searched for. 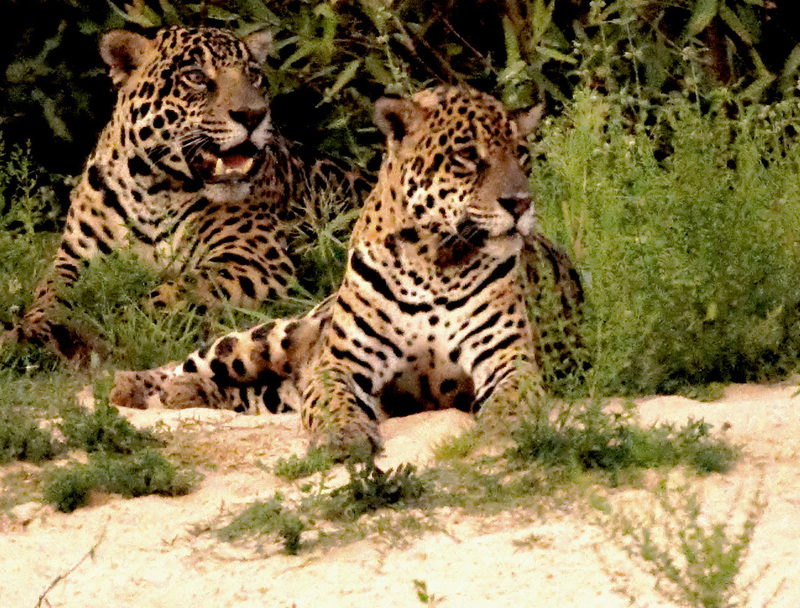 From this first photo you can see how easy it is to pass by Jaguar after Jaguar if they don't wish to be seen. 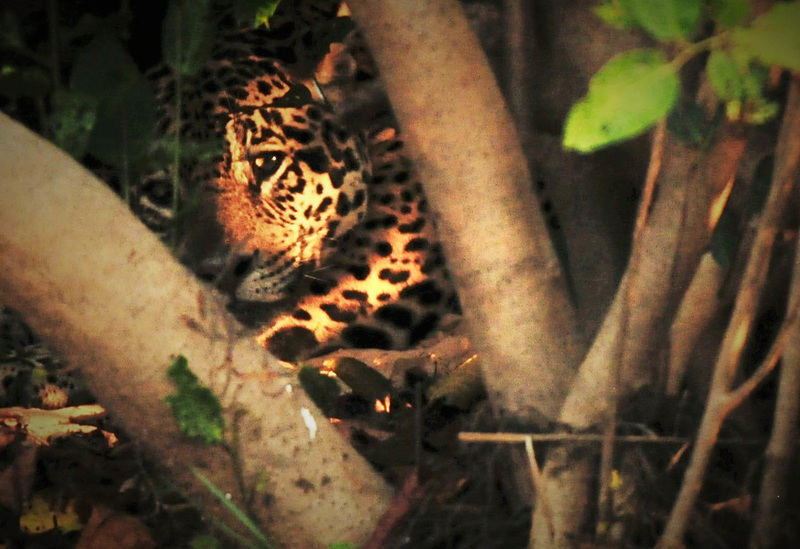 To remain stealth, or escape the beating sun, these cats just tuck themselves into the shadows along the river and virtually disappear. We didn't wait long before the cubs started to get restless. The mother seemed to move with calculated purpose, while the cubs seemed to explore every little aspect of the river bank. Under the watchful eye of their mother they continuously learn from their her guidance and the environment around them. Here the mother leads them along the water and prime hunting areas. 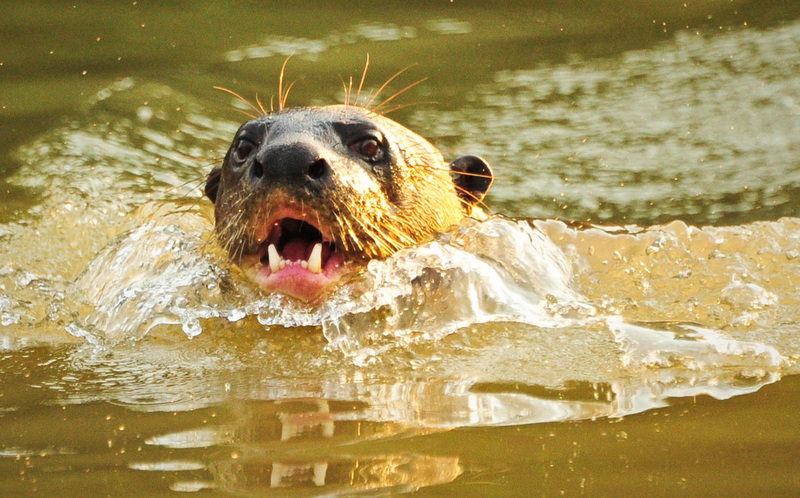 Everything needs water to survive and all creatures, including these incredible predators, live, breed and die along the river. Mom made one more appearance before the family went deeper into the jungle and the sun set closing out another amazing day. We always maintained a good distance from the Jaguars. 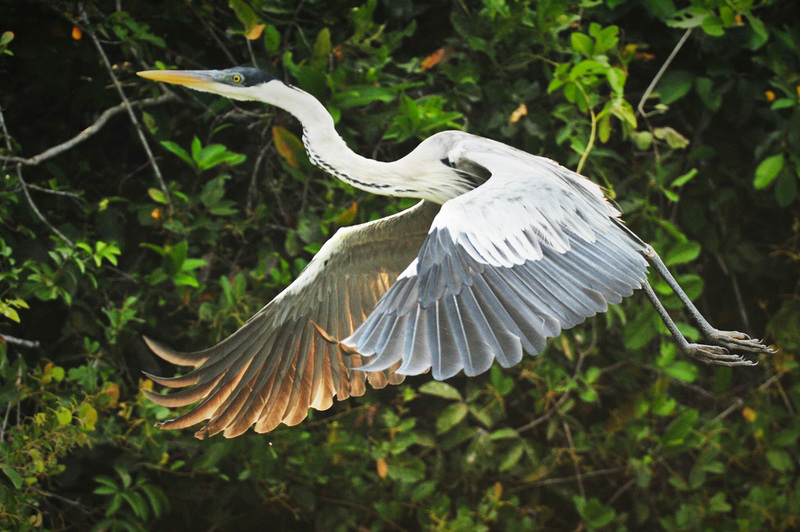 These amazing creatures are very comfortable with boats around, as these waterways have been used by local fisherman for generations. I am beginning to realize this area is a very special place. My mind is racing with the what our remaining days will bring. Hope you enjoyed Part 2. 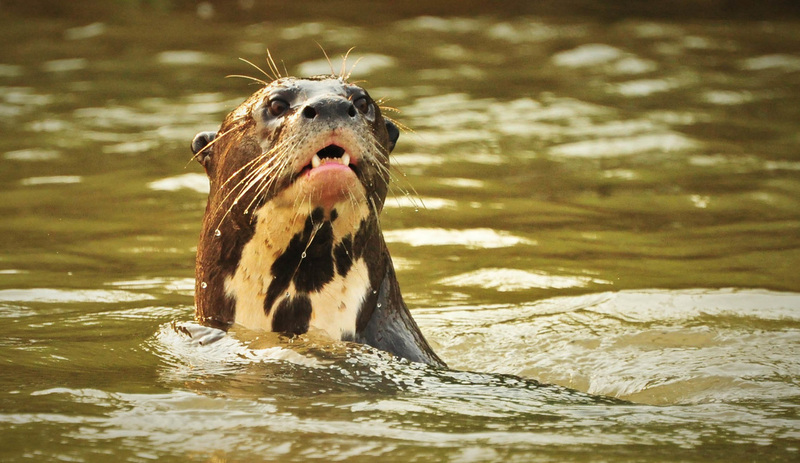 Our focus in the next days will switch to Hyacinth Macaws, more River Otters, and of course more Jags. 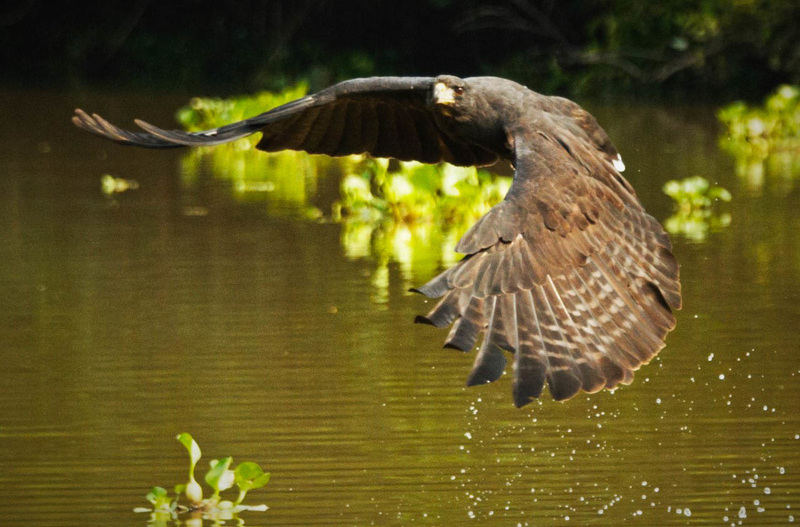 ﻿ I'm back on an amazing journey to southern Brazil in the wildlife rich region of the Pantanal. 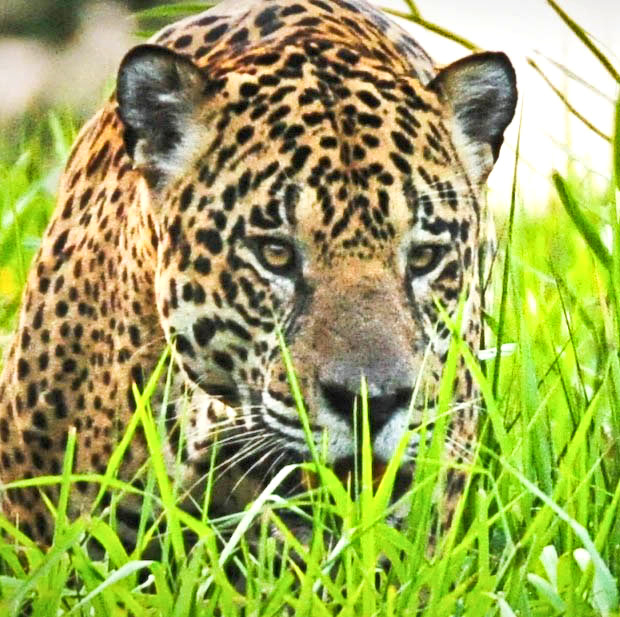 My main focus is the rare Jaguar. 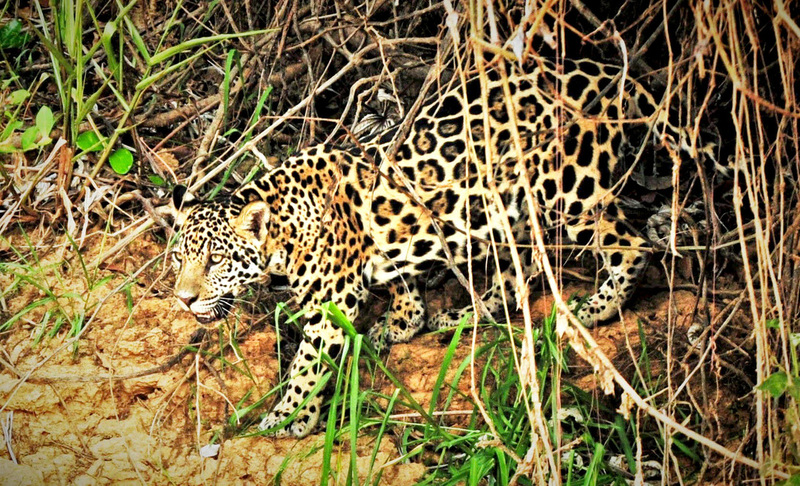 This beautiful cat is endangered in most of its historic range of Central and Northern South America. 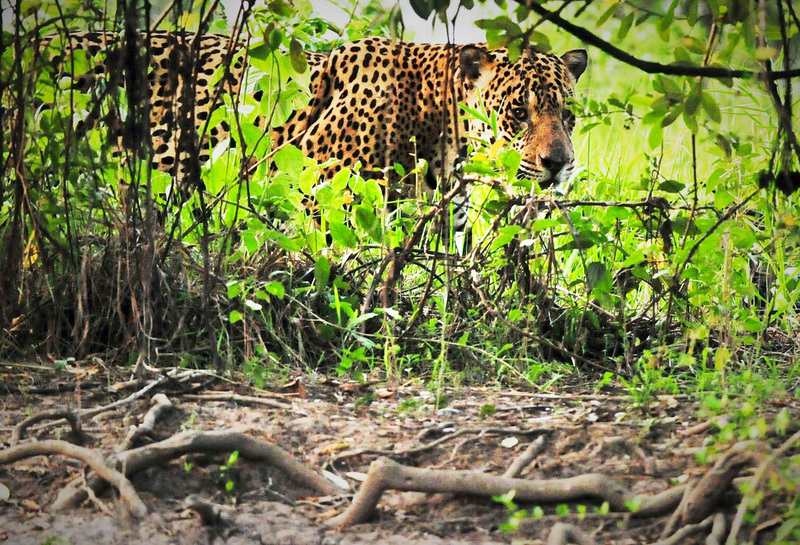 In the Pantanal jaguars still have a high density and a small stronghold. Here you find the largest anywhere in their range and they need this size in order to hunt their sizeable prey, which include Caiman (cousin to the American Alligator). Our goal is to see a few of these incredible cats in the next couple weeks. We started out in 4x4 vehicles down dirt roads that made their way through large cattle ranching areas. 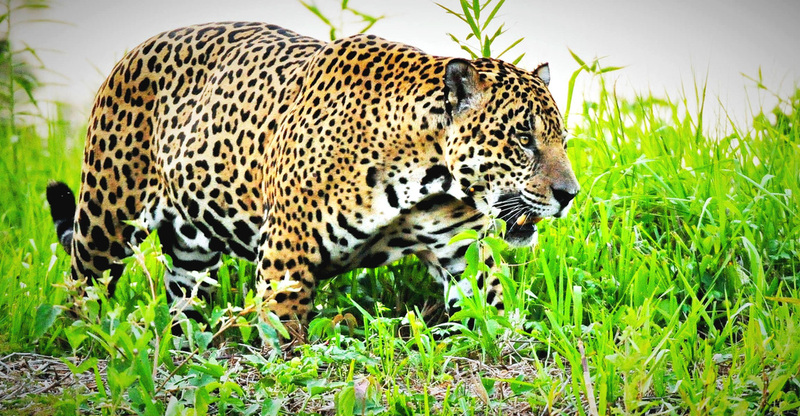 Rancher / Jaguar conlicts are a direct threat to populations of this big cat. These first couple days gave us a glimpse of the vast terrain of the Pantanal's huge savanahs and the river systems snaking their way through it. We then transferred our gear to a 15 ft aluminum boat for the rest of our time on the river. 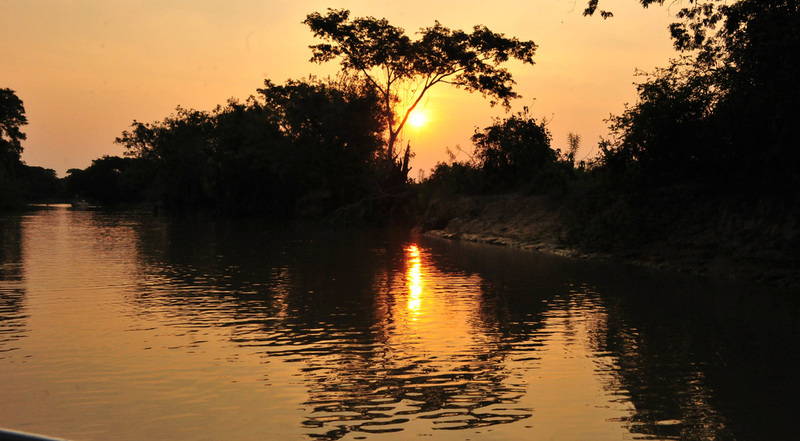 It is along these river ways that wildlife concentrates and predators thrive, the main player in this area is the Jaguar. Daily, our routine was simple... getting up at sunrise, gear up and go... returning at mid day when temperatures soared.... then out again to days end. 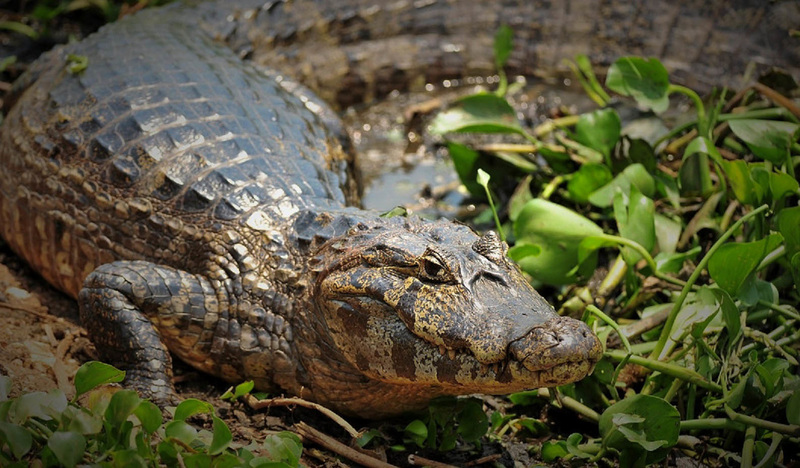 As we moved into the heart of the Pantanal we encounter frequent sightings of Caiman. Here these timeless reptiles max out at 7-8 feet and are numerous in the waterways numbering in the tens of thousands. Unfortunately for them, all these creatures are potential Jaguar food. By the end of day two we were in the heart of the Pantanal. We were quickly notified by some locals that a big male Jaguar had made a kill on an Anaconda earlier in the day just up river. We immediately went to its location. With a little searching we found it resting in a dense patch of bushes just by the river, but not visible enough for any photos. Patiently we waited for hours in the hot sun (43 C / 110 F) hoping for some movement. 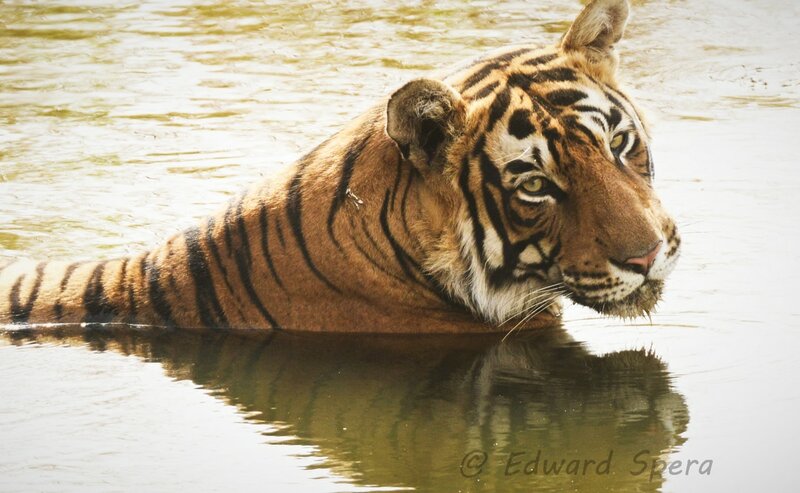 As the sun set this big male made his way down to the river for a drink and a walk in the cool water. Amazing... our first Jag of the trip. He didn't stay around long, but gave us a taste of what the days ahead would bring. As light faded we approached our floating base camp, but the day was far from done. Our boat man spotted another Jag just down river resting on a sand bank at the waters edge. This was an even bigger male, approx. 300 lbs, noticeably larger than our first one. After a long day escaping the heat Jaguars will come out to the water to cool down. Our sighting again was brief, but spectacular. We actually spotted one more male just before we called it a day. Just a little further down river another Jag was spotted. Night was upon us and photos were impossible, but it was great to see our third big cat of the day. ​ I didn't know what to expect coming in to this trip, but if the first couple days are any indication I'm going to need more photo storage. Wow. 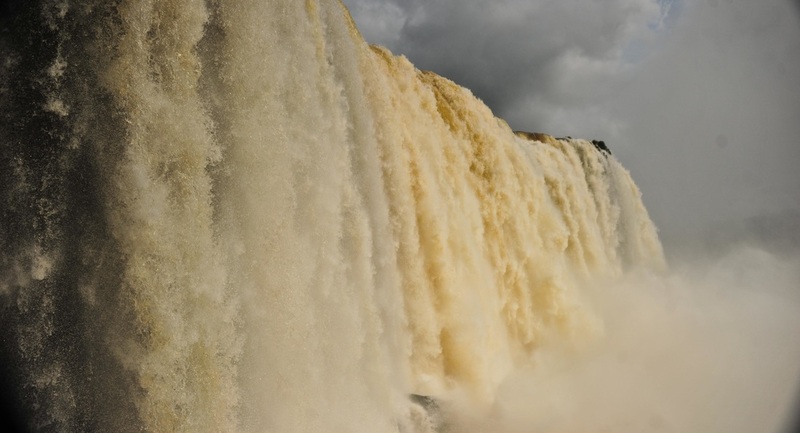 Hope you enjoyed Part 1 from Southern Brazil. Part 2, 3 and 4 on the way. After networking with a few photographers and a little research we now found ourselves heading to Sri Lanka in search of Leopards. We've had some good success in Africa with these beautiful cats, but always hit and miss as to when and where you might see them. 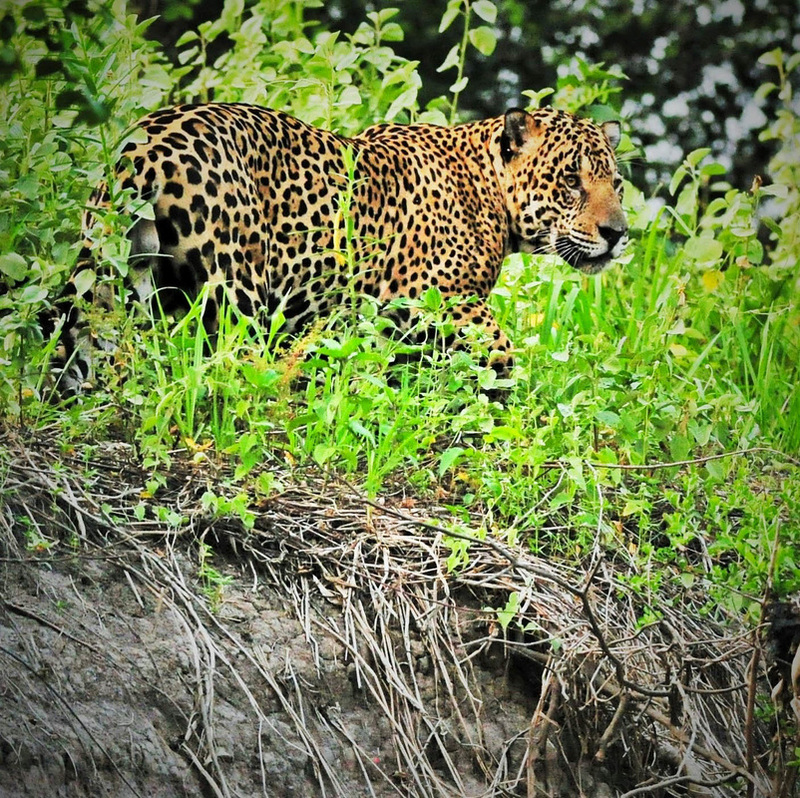 Now we had information about a park in Sri Lanka on its south east coast called Yala NP, that virtually guaranteed us of seeing leopards. This park claims to have the highest concentration of these apex predators anywhere in the world and sightings are said to be regular. We'll put this claim to the test. Our first hour into the park on day one and our first leopard, a big male stalking spotted deer in the early morning light. For those who don't want to think of the final outcome, he was unsuccessful this time around, but the setup of the hunt was incredible to watch. Over the next few days we had a few quick sightings, but no photo ops. 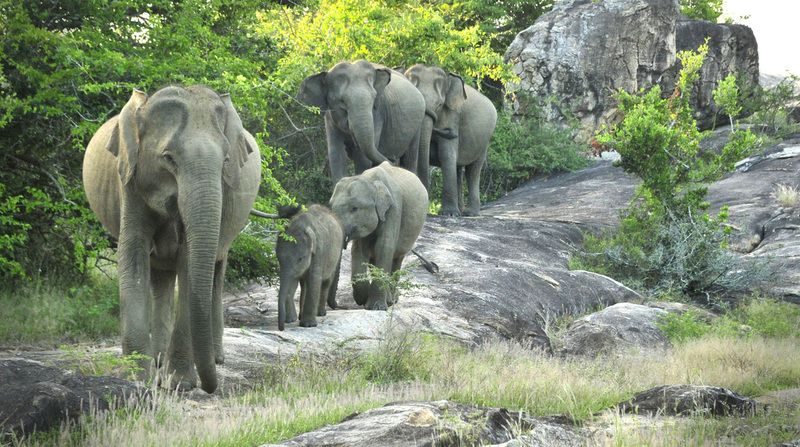 However, Yala is also known for its wild asian elephants. One small family in particular, which included a one month old baby, gave us a few incredible memories over a period of days. At one point they walked up to our jeep and began touching the hood and front bumper with their trunks. It seemed like these intelligent creatures were introducing the baby to this strange machine we were in. 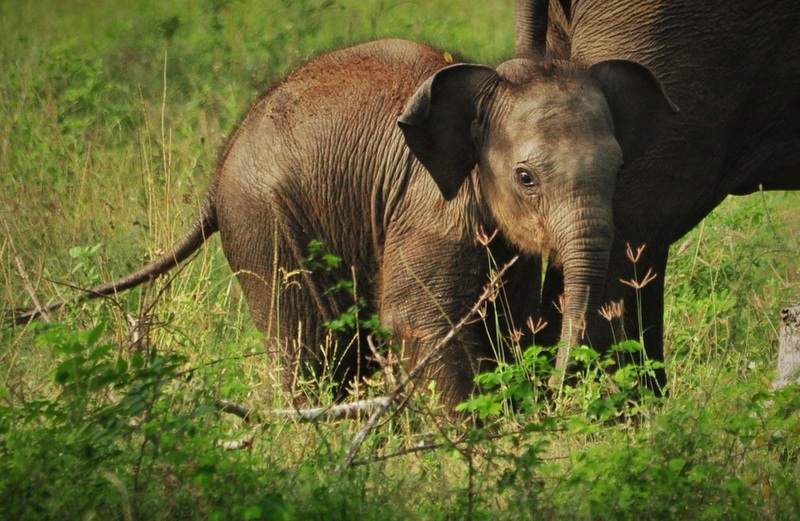 You could see the curiousity and amazement of the little one as it peered through the legs of the mother and aunt. 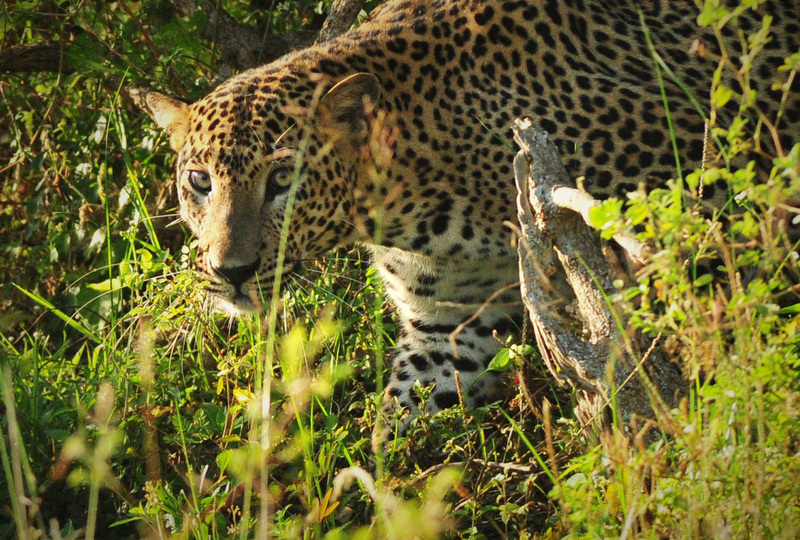 Now back to the leopards... back to back days of good sightings. 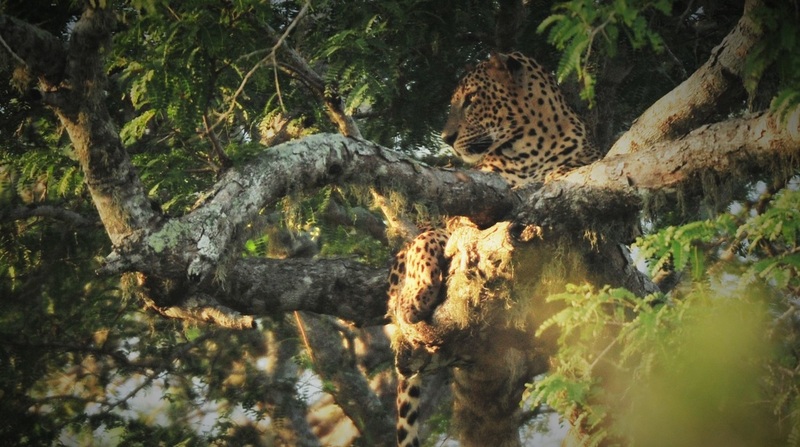 Two great scenarios of a leopard on a rock formation and the following day a beautiful male perched on the branch of a majestic tree. 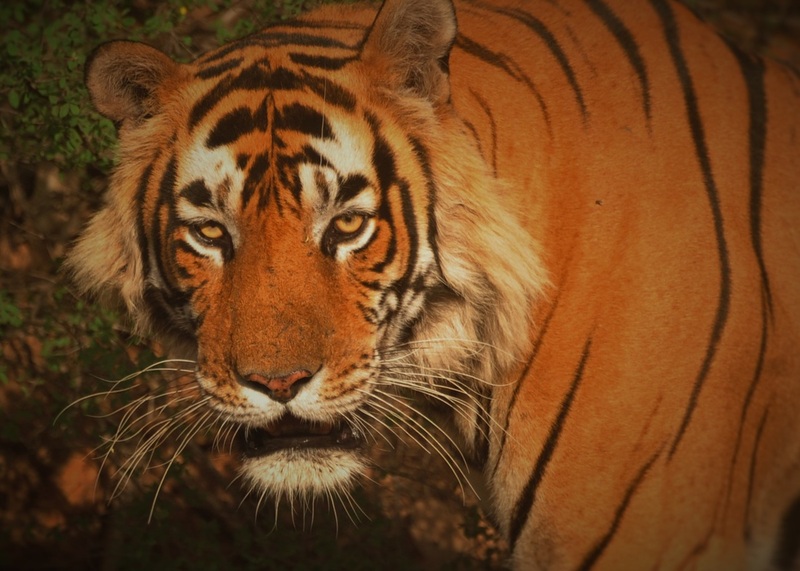 How the trackers spot these animals sometimes still baffles us. 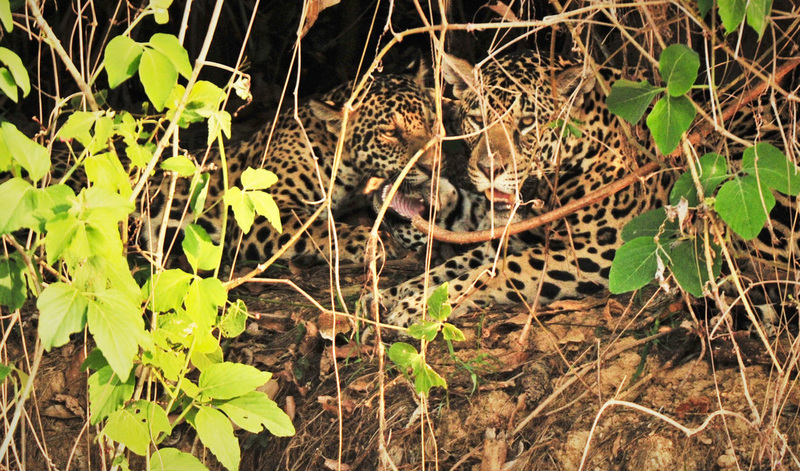 In the end Yala National Park lived up to its reputation, ten leopards in 5 days was the final count. Additionally, Sri Lanka is a clean lush beautiful country with friendly people. It goes without saying we will be back. Hope you enjoyed this adventure update. Safe travels. Our last day started very very hot. We drove the early morning light tracking the mating couple from the other day. Yesterday was very quiet and we were hoping for a grand finale moment today. We came across some monster sized pugmarks and this meant only one tiger... "Fateh" (meaning victory). He is over 600 lbs and is the male from the mating couple. No signs of the female tracks so the exotic fling was over. We waited for some time to hear any alarm calls... nothing. He was now hungry and eager to mark his territory. We headed to a nearby riverbed and before long received a message from another ranger that Fateh was on the move behind us. U-turn and back we bolted. Within a few minutes there he was confidently walking along. With an almost arrogant attitude about him, he ignored our vehicle slowly driving alongside him at a 20 foot range. For 45 min. we followed him along the winding dirt road positioning ourselves for some great camera angles as he intersected the trail repeatedly. What's amazing is Fateh is only 8 years old and a few years away from being in his prime. He is going to be huge and we can't wait to come back and see him down the line. My Name is Edward Spera. I am a Wildlife artist and would love to share my wildlife adventures with you. As I travel the world, looking for inspiration I will be sharing what I can along the way.